Noticeable plants of the upper meadows include Greater Knapweed, Hardheads (=Lesser Knapweed), Field Scabious, Meadow Cranesbill, Alexanders, Pyramidal Orchids, Yarrow, Eyebrights, Musk Thistles, Perforate St. John's Wort, Sweet Violets, Horseshoe Vetch (in May) and many others. Just over 30 acres still remain as public open land. This is divided into about 11 acres of grassland and meadows above the ridge, about 9 acres of scrub, the copse and glades at the northern end, and about half of the prime Chalkhill Blue area of 6.4 acres of herbland remaining. The casual visitor will usually miss the best area. Six acres of butterfly land was lost to a Sycamore woodland on the southern slopes. This is low fertility chalkland not suitable for grazing. The top area is effectively a wild meadow and the lower slopes a rabbit warren dominated by prostrate (not the upright form) Horseshoe Vetch. 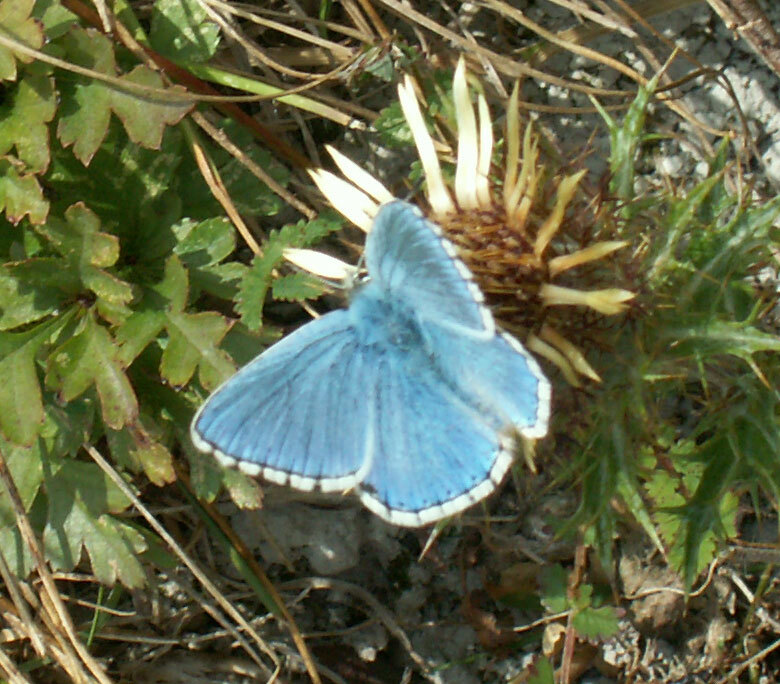 Mill Hill is nationally important because of its population of Chalkhill Blue Butterflies. Estimates of the numbers are notoriously inaccurate. In the 1950s the population was estimated by R. M. Craske to be 50,000. This may be an exceptionally good year. I would estimate the numbers at that time to be nearer 25,000 for Mill Hill only. After the cattle grazing and thorn incursions the numbers plummeted to the most reliable estimate in 1960 of 6,000. The new road and Sycamore woodland further denuded the Horseshoe Vetch and bare chalk downland to a figure I have estimated at a top figure of 3,000 Chalkhill Blue Butterflies at the turn of the millennium (counted in 2003). 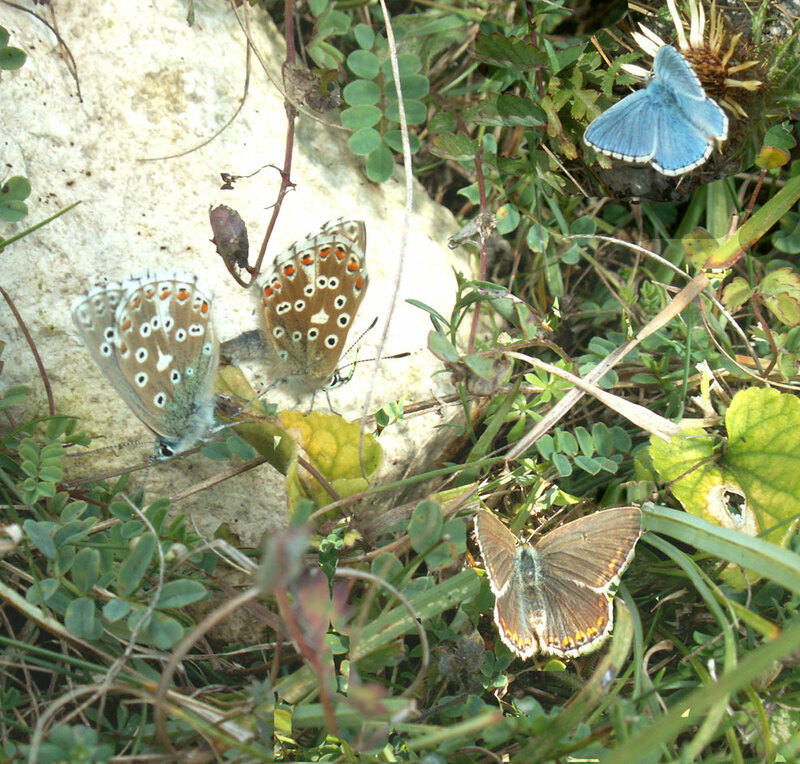 Almost all these butterflies are now to be found on the six acres of the lower slopes. The South Downs Conservation Board were constructing their unpopular water troughs for cattle. There is local opposition (almost unanimous) to putting cattle on Mill Hill. 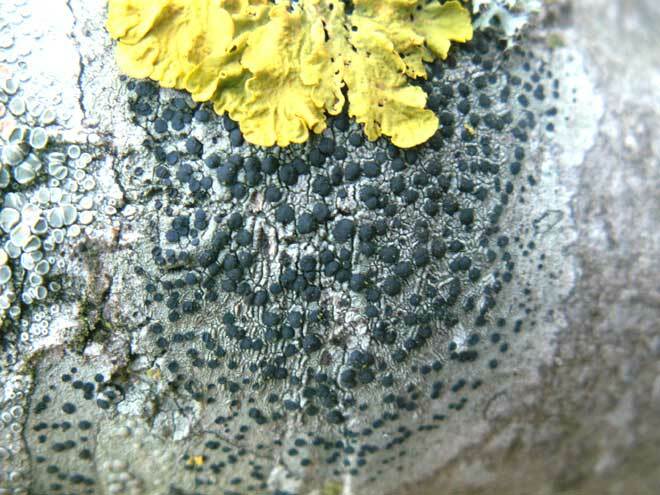 The land is not suitable for grazing and the cattle will quickly and permanently destroy the butterfly food plants. There were no signs of any butterflies or flying insects on the overcast afternoon, after the showers (3.81 mm) in the morning. I spotted a male Kestrel resting on a Privet bush with his back to me, and below me as I walked along the ridge, and it was there for 30 seconds before he spotted me and flew off. Later a Wren (probably numerous on the scrubby downs) flitted in front of me and a Robin called territorially from the top of a Hawthorn. 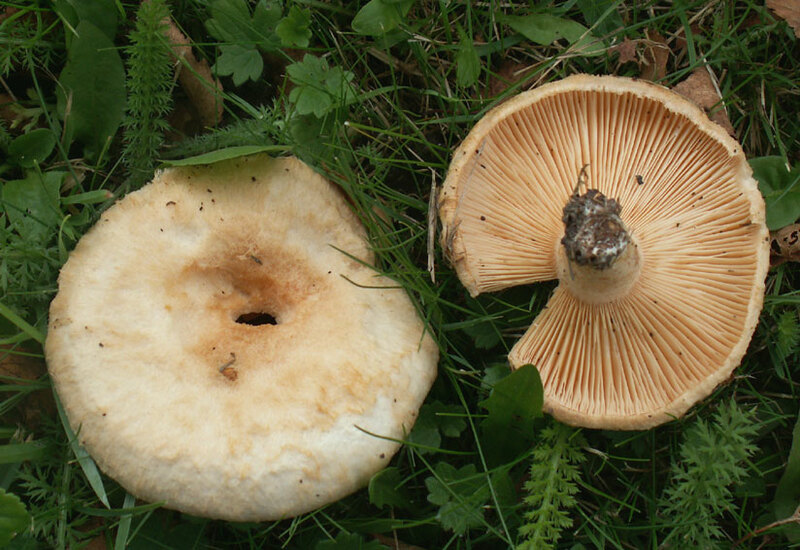 The remains of a Field Mushroom were seen on the ridge north of the Reservoir. 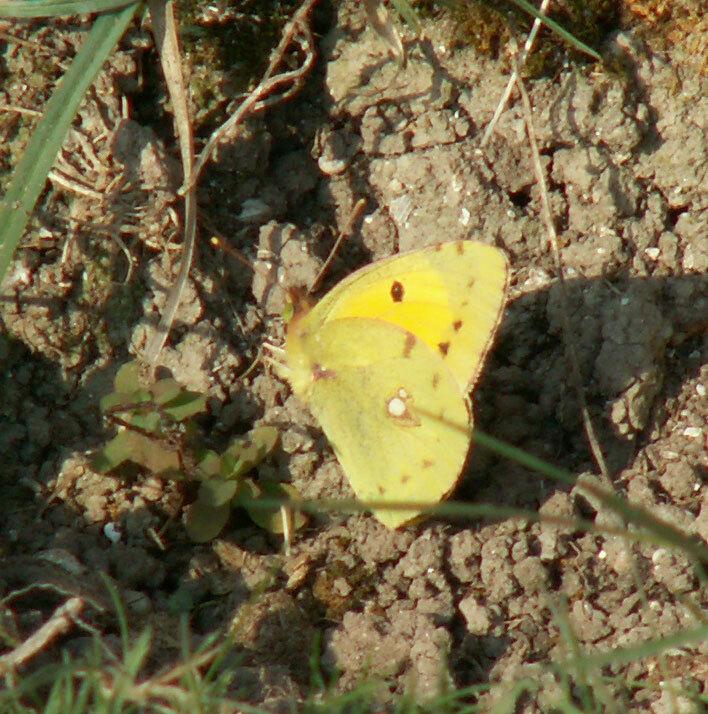 Eleven Clouded Yellows, including one form helice were seen at Mill Hill in the afternoon about 3:00 pm. Despite the fair (11.8 ºC) weather they were rather sluggish, spending most of the time on either warm scree or the wooden boards of the steps and tilting themselves perpendicular to the sun's rays. On a clear day, 11 (to 13*) Clouded Yellow Butterflies were seen on Mill Hill (6 -8* on the lower slopes and one on the ridge by the Reservoir) and on Old Erringham pasture (4). One of the Clouded Yellows had white upper wings but conventional (if slightly paler) underside, and one was a faded yellow and very tatty. 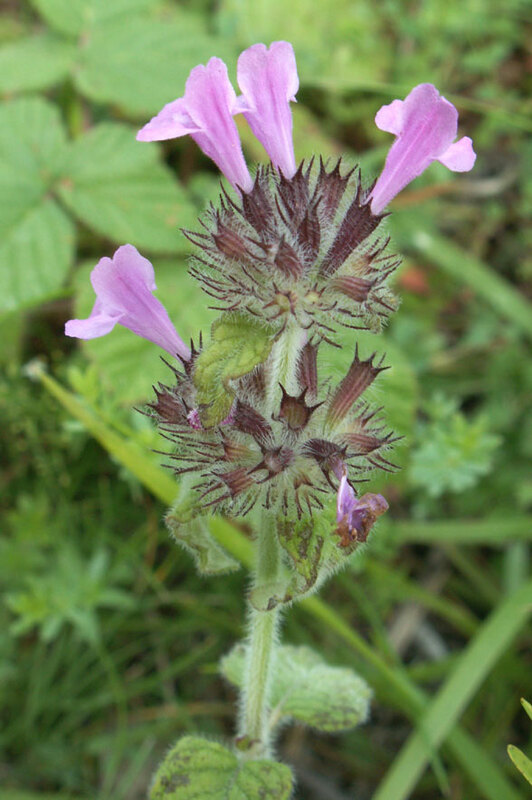 They were very flighty, rarely stopping for more than a few seconds at each flower, and on the lower slopes of Mill Hill they visited Devil's Bit Scabious (in hidden places I had not noticed it before) and Autumnal Hawkbit and Wild Basil. On the Old Erringham pasture near the stile adjoining Mill Hill Nature Reserve, two of them were courting rising together vertically, and their preferred nectar plant was Dandelion. 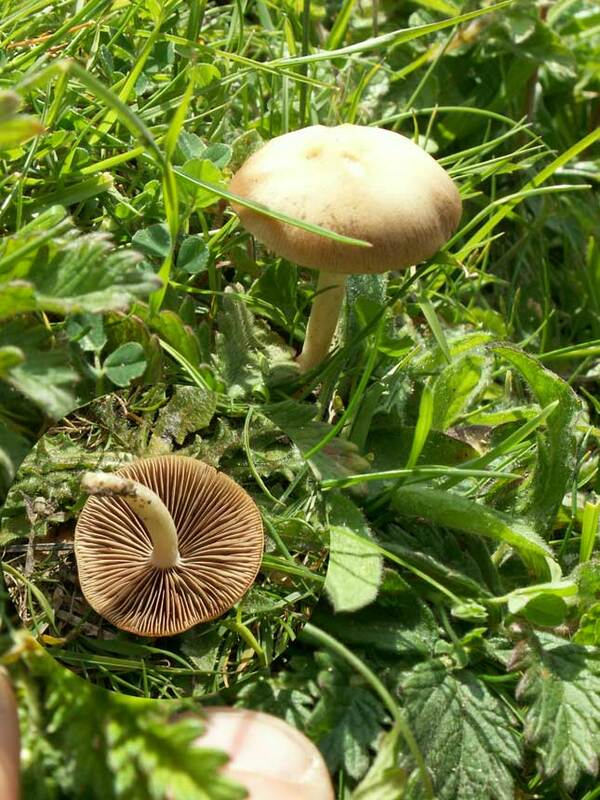 I spotted what were half a dozen probable Lactarius pubescens (a type of Milk-Cap)* on the verges of Mill Hill Road where the Bee Orchids were discovered earlier this year. They were on grass and herbland about one metre from two Silver Birch trees. 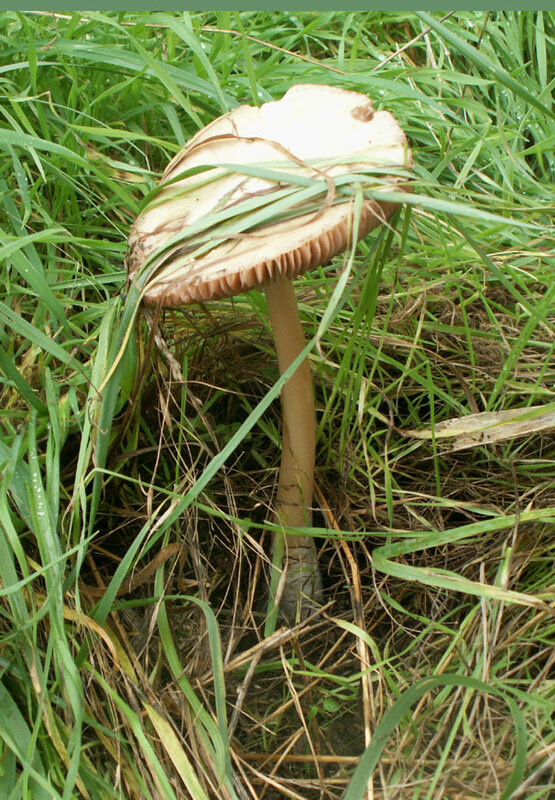 Amongst a patch of long grass near (west of) the Reservoir and surrounded by Hawthorn bushes, the tall mushroom Volvariella gloiocephala was spotted to the side of me as I walked along the path. Butterflies at Mill Hill, Shoreham in the sunshine out of the breeze after a very wet morning: 1 Red Admiral; 1 Meadow Brown (very tattered) and an amazing 10 Clouded Yellows. Under the midday sun a remarkable air temperature of 16.6 °C was attained which brought seven species of butterfly out: Red Admirals (26), Comma (2), Large White (1), Clouded Yellow (3), Meadow Brown (9+), Common Blue (3) and a Peacock Butterfly (1). This was the first ever record of a Peacock Butterfly during the month of October recorded on these Nature Notes. 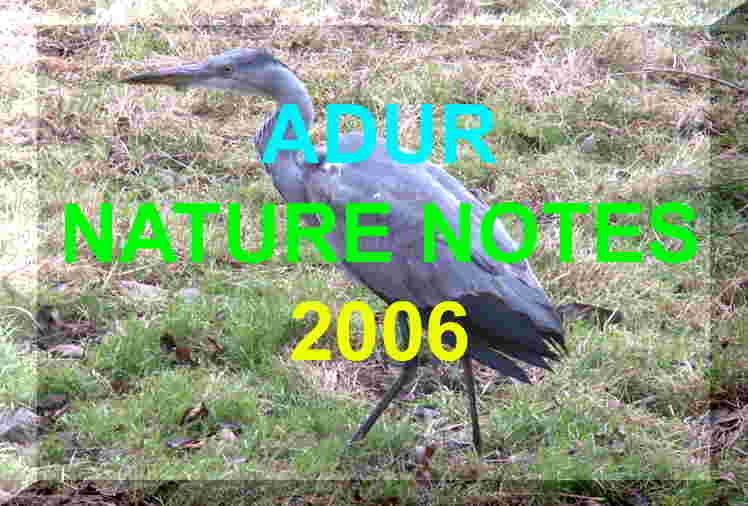 It is seen very clearly before it flew upwards and away. 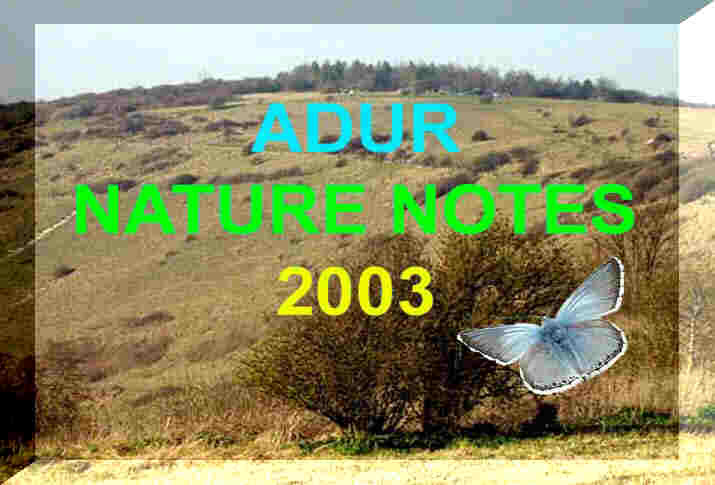 All the butterflies were seen in just over an hour on Mill Hill and the approaches to this small public open space nature reserve north of Shoreham-by-Sea. Two Comma Butterflies, one Red Admiral, one Meadow Brown and one Clouded Yellow were seen on Mill Hill. 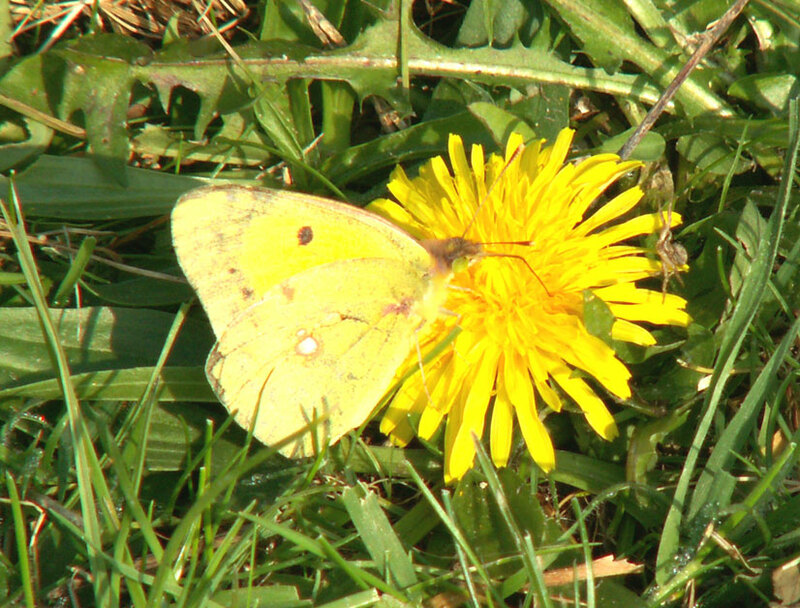 Two Clouded Yellow Butterflies were seen on the upper part of Mill Hill. There were at least seven Common Blue Butterflies and 18 Meadow Brown Butterflies all on the lower slopes of Mill Hill, and one Small Copper on the Devil's Bit Scabious. A Small Copper Butterfly that landed on a path in front of me through the long grass on the Mill Hill gentle slope west of the upper car park came as a surprise with the ordinary fare of butterflies on a sunny early afternoon. The butterflies are fading earlier this year and the upper meadows on Mill Hill had only a small population of the frequent Common Blues. The lower slopes were much reduced as well. The overall numbers of the others were Speckled Woods 10+, Large Whites 15+, a few Green-veined Whites, Clouded Yellows 8, Small Heaths 13, Adonis Blues 22, Chalkhill Blues 2, a few Red Admirals, a possible Brown Argus or a few (to be confirmed), one bright Comma in the Hawthorn wood of the north-west, and with the most numerous Meadow Browns 40+ that was it. Treble-bar Moths (25+) were frequently seen on the lower slopes of Mill Hill. The dragonflies known as Common Darters and Southern Hawkers (including mating pairs) were seen occasionally. A handful of Swallows and/or House Martins swooped low over Mill Hill. With the sun out and the air temperature rose to 24.2 ºC at 1:15 pm, humidity 74%, I just could not stay in so I went for a small cycle ride after the gales of two days ago. On a humid day the first Autumn Gentian and Autumn Lady's Tresses (an orchid) were spotted in flower on the upper part of Mill Hill (just north of the Reservoir). 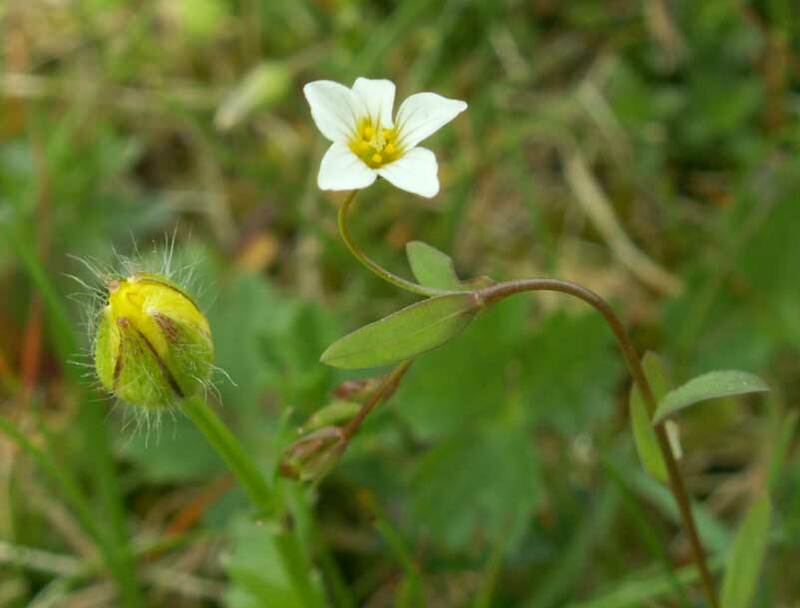 These are both small plants that can only be seen in the short sward. Mill Hill blown about by a negligible Moderate Breeze added a further selection of butterflies including 49 Adonis Blues, very frequent Meadow Browns on the lower slopes with, occasional white butterflies, occasional confirmed Brown Argus Butterflies, but just the two mating Chalkhill Blues. The scrub in the north-west added a Comma that flew over the lower slopes, and at least five Speckled Woods. Just a small part of the top area visited was attractive to three Small Heath Butterflies, a Brimstone Butterfly with a few mostly female Common Blues and occasional Meadow Browns. 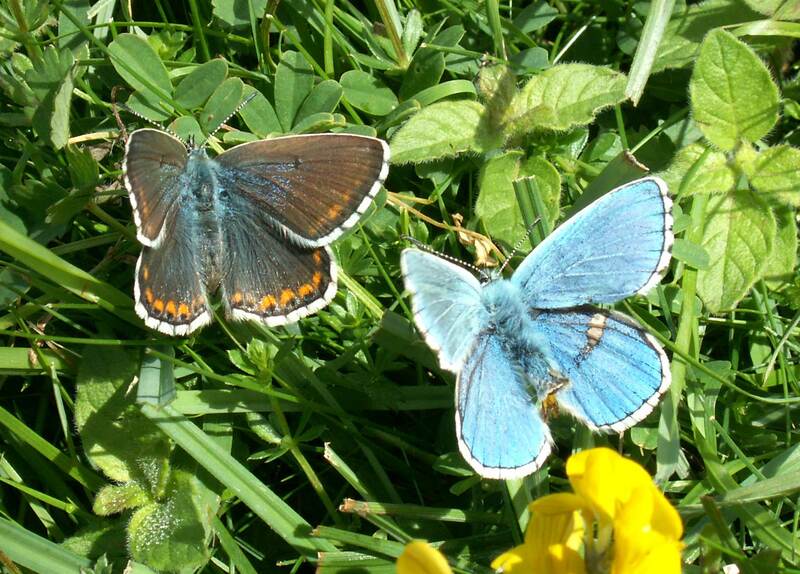 Adonis Blues (128+) were mating on Mill Hill on a breezy midday. The count was 110 (about 13 females seen) on the lower slopes and 18 males above the ridge. This was the most I have ever counted on Mill Hill. 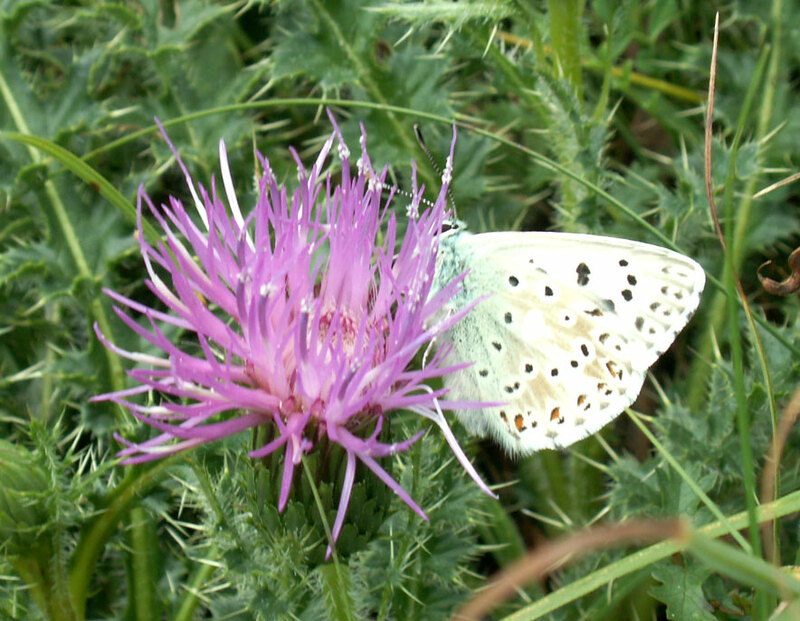 There were occasional Common Blues on the lower slopes and they were still frequent on the upper meadows so distinguishing the species was not always automatic. The Adonis Blues were evenly spread over the lower slopes and I would estimate their numbers on Mill Hill at 350+. All the females were mating or heavily courting (about to mate). Chalkhill Blues were still frequently seen and the figure of 25+ (20 lower, 5 middle and upper Mill Hill) may be under their numbers as I lost count of them. 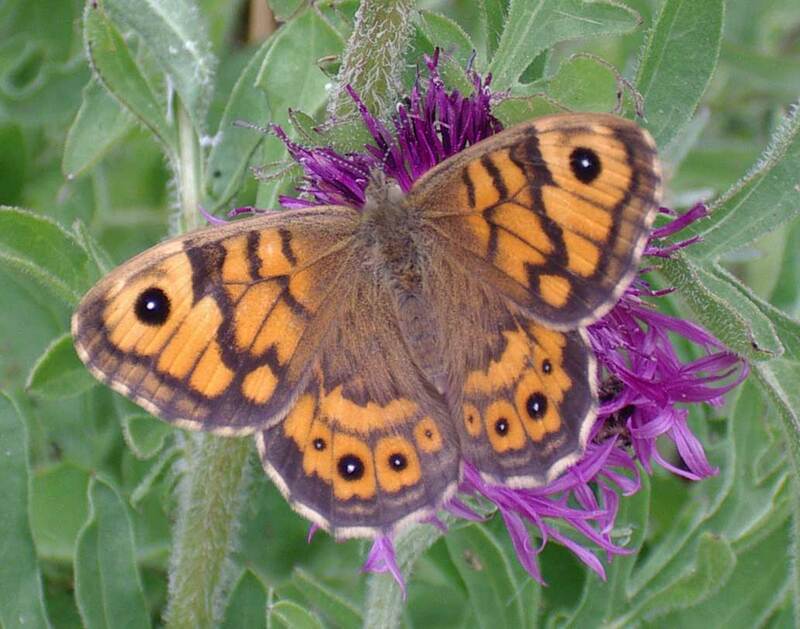 Meadow Browns (70+) were still very frequent, but Small Heath Butterflies (6) were only occasionally seen, with one Wall Brown that did not settle for confirmation over the lower slopes. Large Whites were frequent over the downs, and at least one Small White was seen in town. Almost all the whites, even the smaller ones were Large Whites (although it was not easy to be sure). About a dozen Speckled Woods were seen in the scrub in the north-west of Mill Hill. Faded Brown Argus Butterflies were confirmed occasionally flitting with the Common Blues on the top meadow. A flock of seven Rooks flew over, but headed towards Old Erringham. Predictably most of the butterflies were hiding and the numbers on Mill Hill actually seen were down from the last visit. The walk did not involve stopping and the count was Chalkhill Blues (50) and Adonis Blues (49). The Chalkhill Blues were thought to be undercounted as just north of the Reservoir on the upper part of Mill Hill, I instantly saw one Chalkhill Blue Butterfly, but I dawdled for a couple of minutes and a further seven appeared out of nowhere. Only about five female Chalkhill Blues were included and no female Adonis. Most of these were seen on the lower slopes. Common Blues (90+) were the most numerous butterfly, but these were in far greater numbers on the meadow north of the upper car park where an estimated 60 were seen compared to about 30 on the rest of Mill Hill. These were only a fraction of the total as they were the ones disturbed from the tall herbs (with a large amount of Greater Knapweed) in the meadow. Some of the females were a very dark chocolate brown and much smaller, and there were a confirmed handful (probably many more) of Brown Argus Butterflies. 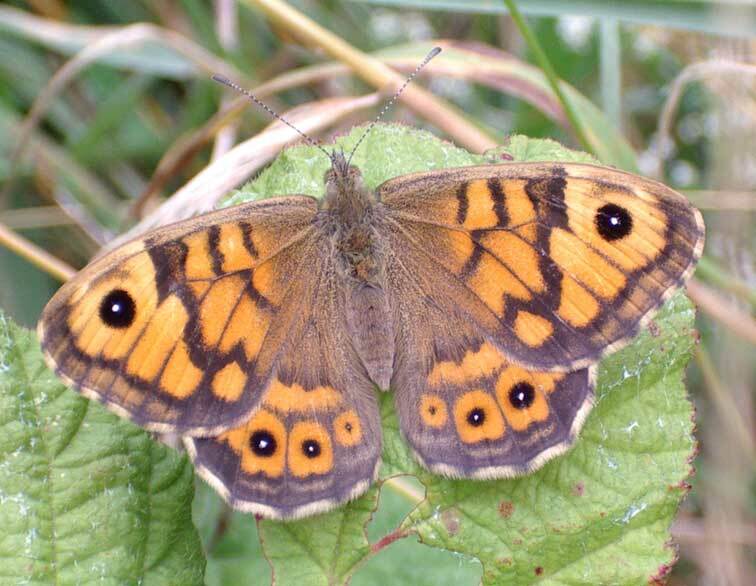 Meadow Browns (75) were widespread with an estimated 50 on the lower slopes where a single pristine Wall Brown and a single Small Heath were noted. Red Admirals were occasional, one Painted Lady was seen in the central area, and four Small Whites in the meadow north of the upper car park, all on Mill Hill. About ten Speckled Wood Butterflies were a familiar sight as I walked through the scrub on the north-west of Mill Hill. Common Blue Butterflies (100+) were still common on Mill Hill, and both the second brood male Adonis Blue Butterflies (66+) and the worn Chalkhill Blues (72+) were very frequently seen on the downs and surrounding areas. 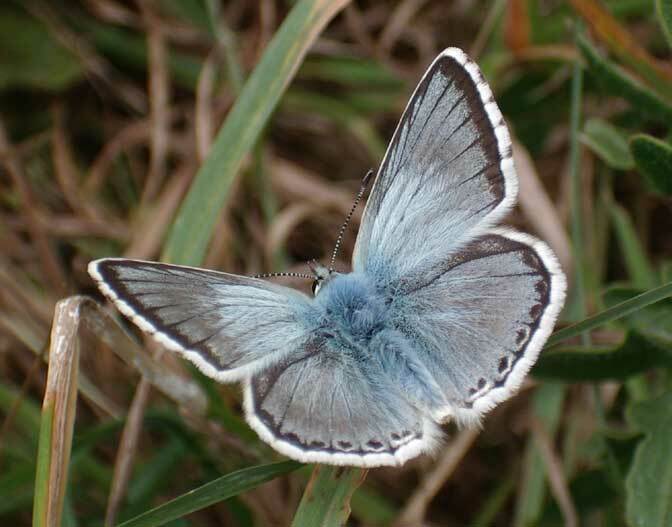 The Adonis and Chalkhill Blues were counted, but the plus signs are included because if there as any doubt if it was an Adonis or a Common Blue it was put down as a Common Blue, and with Chalkhill Blues, possible duplicates were excluded and females are likely to have been overlooked. 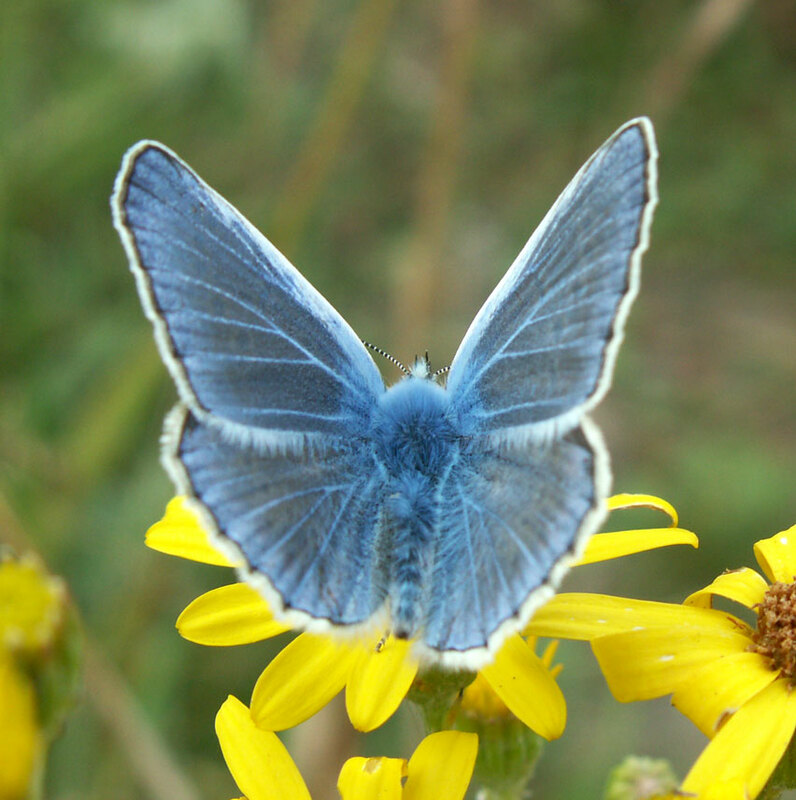 The Adonis Blues were in a bright pristine condition but many of them already showed nicks out of their hind wings. This is the largest count for the second brood Adonis and nearly the largest seen on Mill Hill in one day. The list included very frequent Meadow Browns (75+) on grass and meadows, frequent Speckled Woods (25+) in scrub and shady bits on Mill Hill. 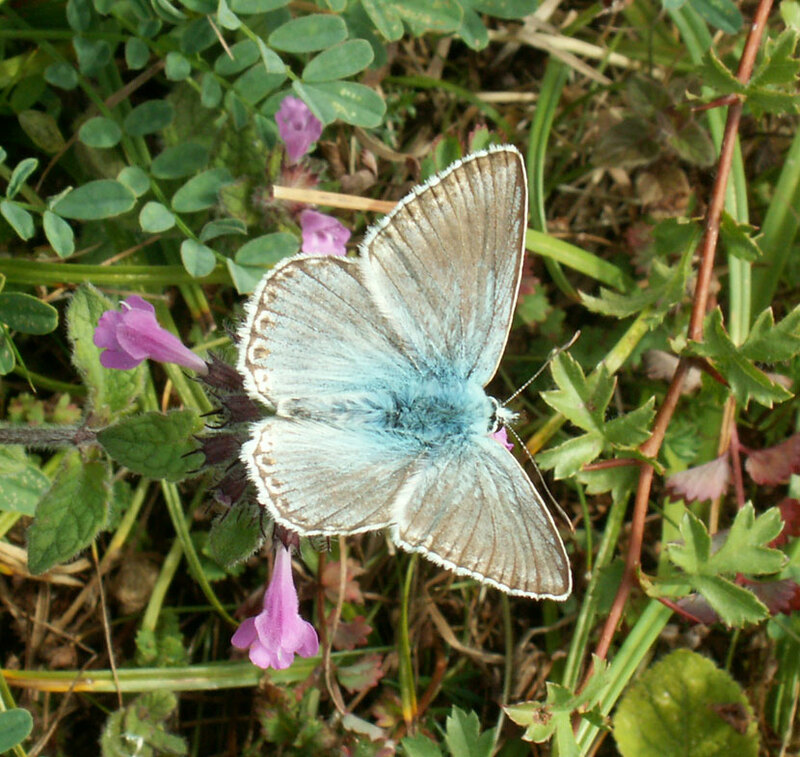 The correlation between the distribution of the butterflies is both the Adonis Blues and Chalkhill Blues are centred around the presence of the correct prostrate type of Horseshoe Vetch on the short sward. 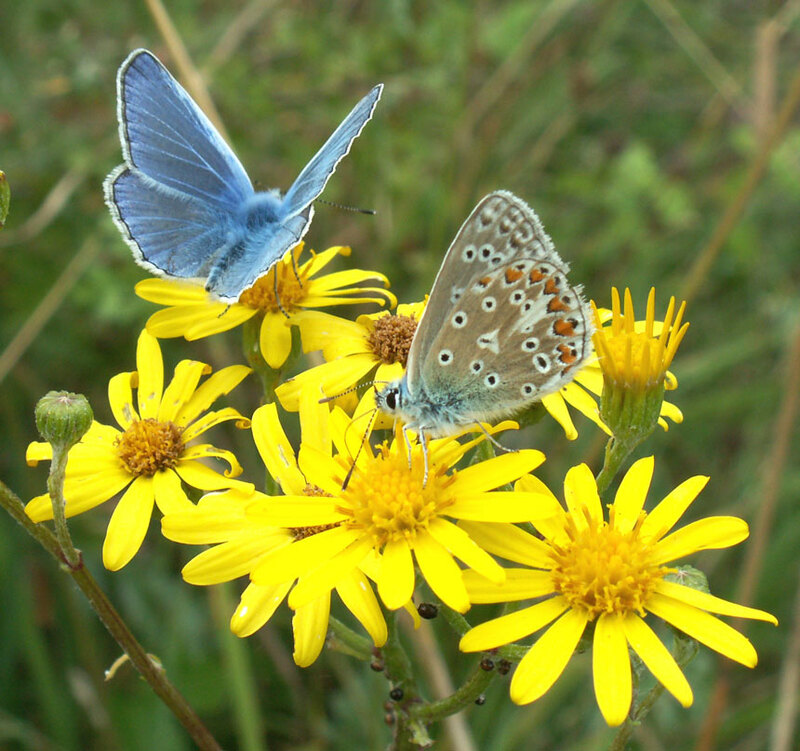 The Common Blues larvae feed on Bird's Foot Trefoil and roost in the tall grass meadows. The pasture and agricultural meadows do not support any larval butterflies, but contain vagrant butterflies. The Holly Blue larvae feed on Holly and Ivy and the adults (imago) of this butterfly is to be found near hedge containing both of these larval food plants. 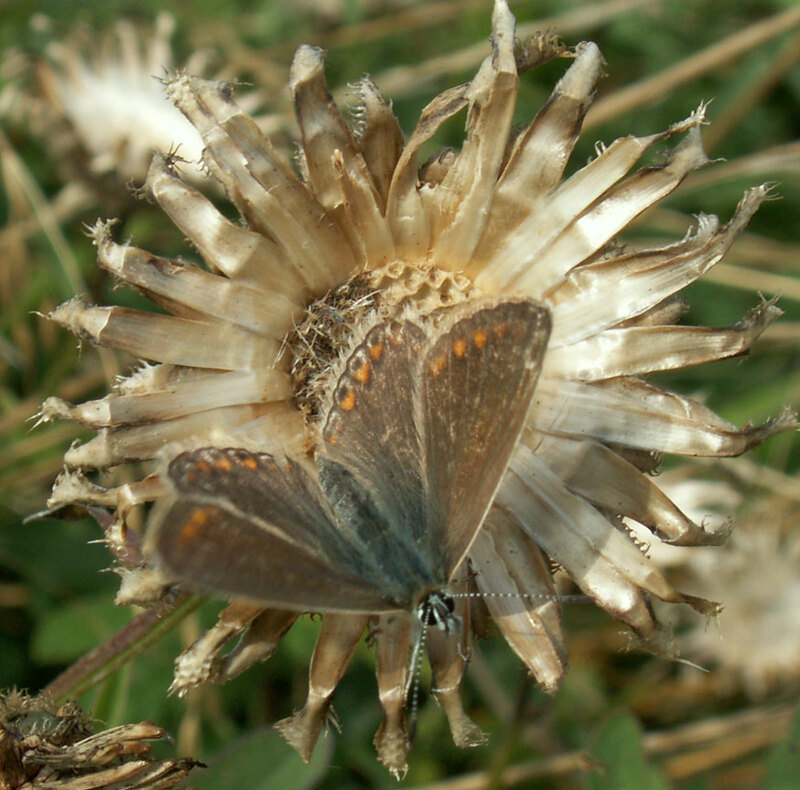 Brown Argus are found in the tall meadows. 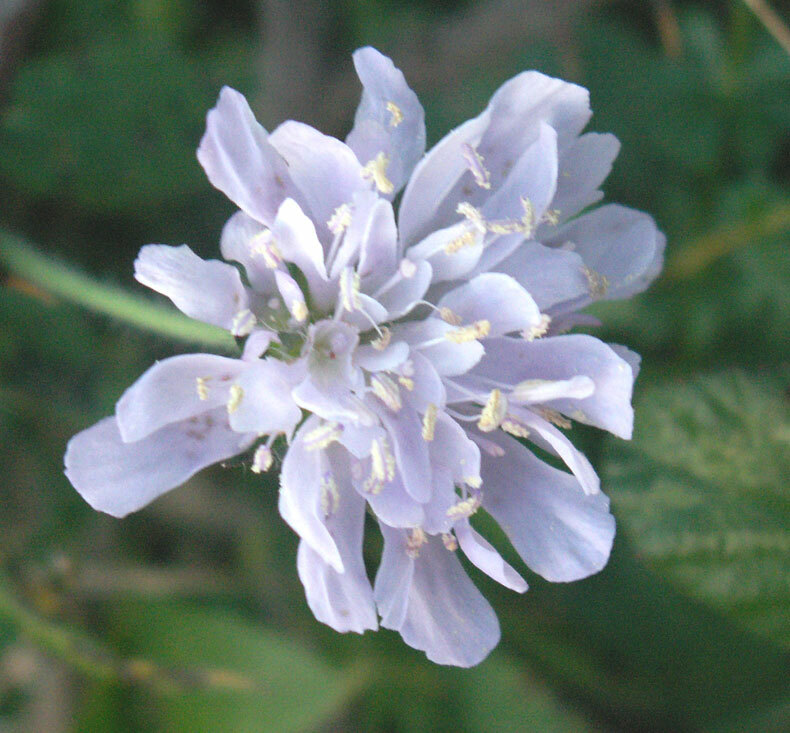 Their larval plant on Mill Hill is still undecided but it could be Meadow Cranesbill. It is strange how the Common Blue Butterflies of two days ago quickly diminished or dispersed and the estimate was now less than half at only 100 on Mill Hill. Chalkhill Blues were counted at 176 (lower slopes 108 middle and upper 39 Mill Hill Cutting 29) and the first second brood male Adonis Blue was seen on Mill Hill. Brown Argus (40+) flitted with the silver underwings, and there were sufficient numbers of them in the meadows north of the upper car park on Mill Hill, to be sure of them, if not their numbers which could have been much more than forty, possibly a 100+. 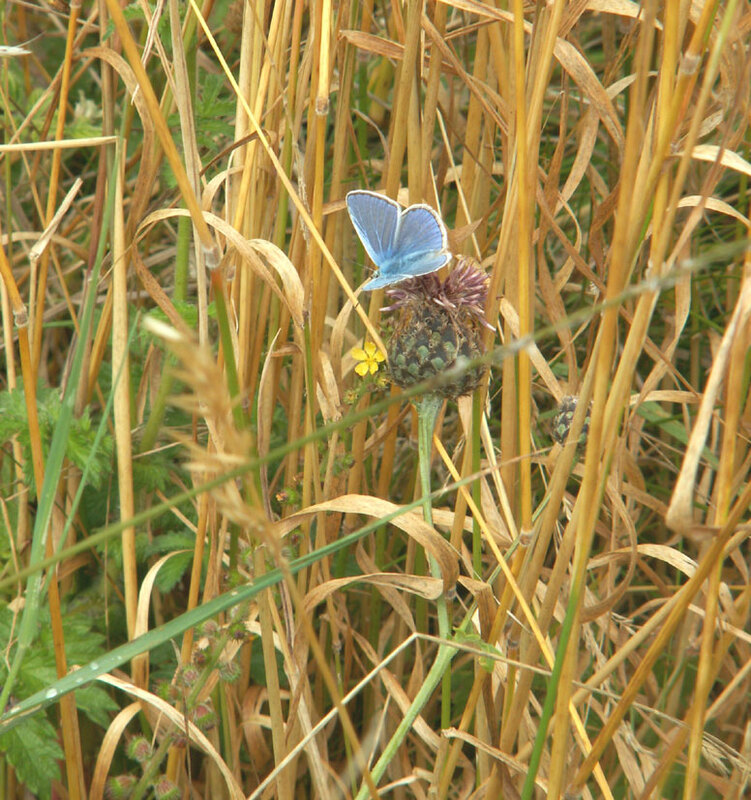 There were so many Common Blue Butterflies in the meadows north of the upper car park, it defied counting them. I must have disturbed at least 200 in 15 minutes or so as I ploughed through the dense meadow. My estimate (conservative guess) of their numbers on Mill Hill was 4500. 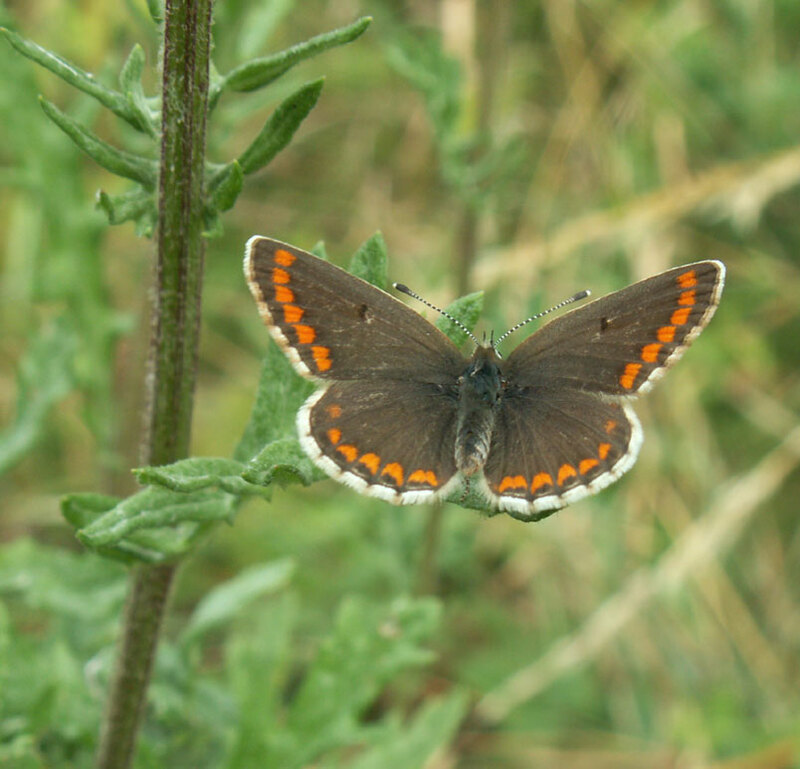 Brown Argus Butterflies (20+) were seen frequently on Mill Hill and now confirmed by a photograph which was not successful on the previous visit five days earlier. The figure of 20 is no more than a guess as it was difficult to separate them from the older female Common Blues as the blue butterflies fluttered all over the place at a density of about five a square metre at times in the meadow north of the upper car park, but not everywhere like this on the hill. Chalkhill Blues (122) were counted on Mill Hill only (Mill Hill estimates at 450 on the hill). This puts the Chalkhill Blues past their peak early this year. Female Chalkhill Blues were at 20% on the lower slopes of Mill Hill. They were counted at 100 on the lower slopes, 12 in the middle area and 10 at the top, but I hurried over the upper area and did not stop for any of the visit. Other butterflies included frequent Meadow Browns and Gatekeepers, occasional Small Whites, Speckled Woods and Red Admirals, two Wall Browns, two Brimstones and one Painted Lady. The yellow flowers of Great Mullein were just beginning to show at the top of the steps down to the lower slopes. Chalkhill Blue Butterflies showed just an average year on Mill Hill with just 151 recorded on the lower slopes in the sunshine, and another 40+ on the upper area, which equates with an estimated day record on the wing of about 650 on Mill Hill. This was disappointing compared to 2003. 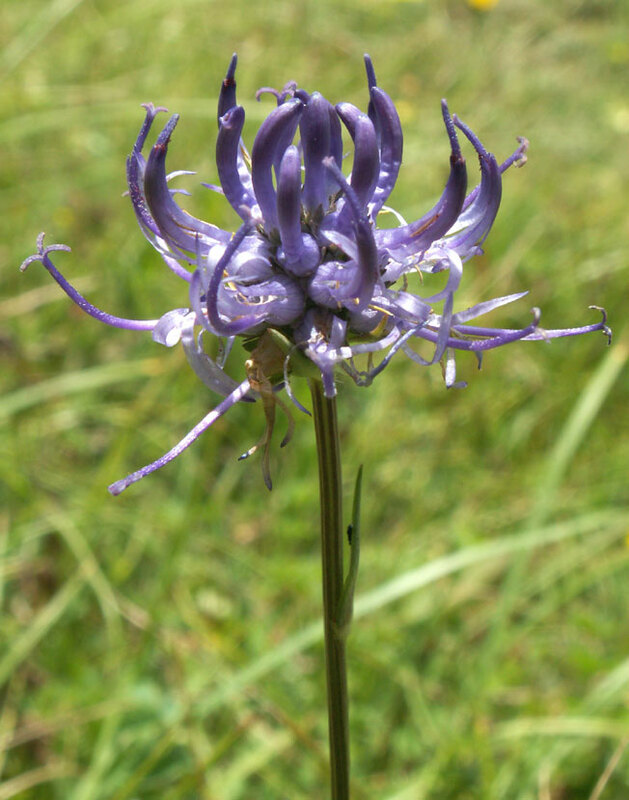 Stemless Thistle was the most often used nectar plant, although Round-headed Rampion was also seen used on one occasion. Females were at 5% only and probably under-recorded. The other butterflies on Mill Hill included Common Blues (90+), Meadow Browns, Gatekeepers, Small Whites, Red Admirals, Large Whites, Speckled Wood, Small/Essex Skipper, Marbled White (10+), Wall Brown (1), Small Heath (1) and Painted Lady (2). 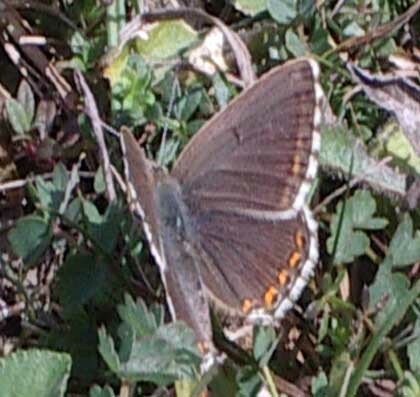 Brown Argus Butterflies were suspected, but all the photographs indicated female Common Blues. On the southern part of Mill Hill, A Hornet Robber Fly settled on the path and another one landed briefly on the Pixie Path. It was cooler and just about tolerable to observe 11 species of butterfly during one hour of the morning on Mill Hill. Chalkhill Blue Butterflies led the way with over 163 seen and 136 of these seen within 20 minutes on the short herb sward of the lower slopes of Mill Hill. Some Common Blue Butterflies had emerged since my last visit, and these were seen in the long grass upper meadows, but because of a rain squall, I have no idea of the numbers involved. The other species of butterfly seen were Gatekeeper, Meadow Brown, Small Skipper, Large Skipper (1), Marbled White, Large White, Red Admiral, Painted Lady and Speckled Wood. 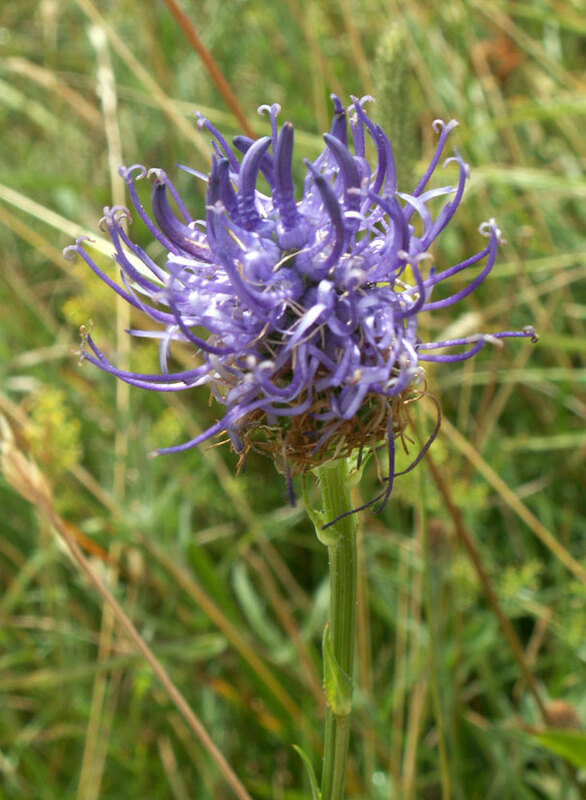 Stemless Thistle was noted as very frequent with Round-headed Rampion, Field Scabious, Greater Knapweeds etc. On the upper meadows the grass had turned yellowish amongst a majority of greenery as illustrated above with a Common Blue Butterfly (there was a Chalkhill Blue nearby as we were swamped by a rain squall) and then a minute later a Large Skipper and Red Admiral. This the meadow area immediately north of the car park where the Meadow Cranesbill seems to be getting swamped out by the long grass. This dried grass is in contrast to the parched green herbland of the lower slopes. The photograph on the far right above shows the Round-headed Rampion. In this photograph you can get some idea of the height of the vegetation in the meadows to the north of the upper car park. The lower slopes are completely different and the herbs are no more than ankle height. There was dead Grass Snake on the Mill Hill side of the road bridge over the A27, already attacked by flies in the baking sunshine and right at the edge of the bridge near the footpath and the first house. I led a small party of children from my sons' school on a butterfly hunt to Mill Hill, Shoreham. We saw 6 Large White, 5 Small White, 2 Large Skipper, 4 Small Skipper, 6 Red Admiral, 5 Clouded Yellow, 1 Speckled Wood and 1 Brimstone. 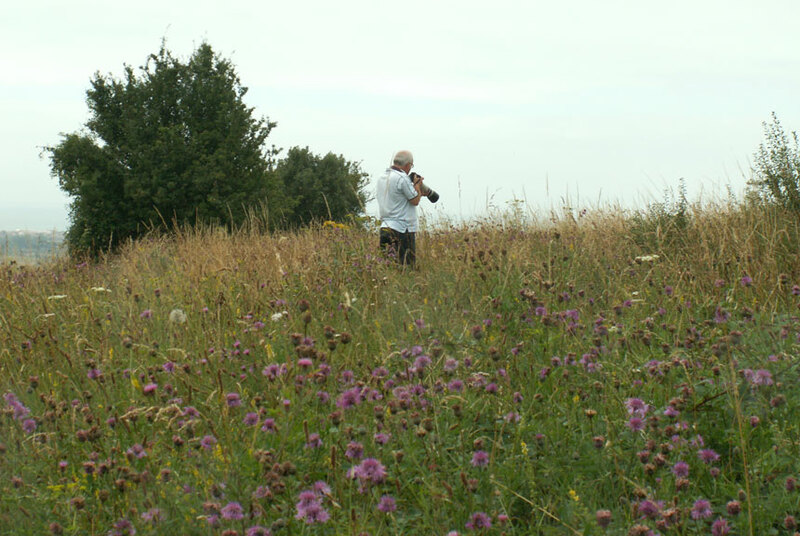 We gave up counting large numbers (30+) of Painted Lady, Marbled White, Gatekeeper, Meadow Brown and Chalkhill Blue. From either side of the steps leading down to the lower slopes from the south, I disturbed three young Wrens that flew to and fro across the path before disappearing into the dense scrub. Marbled White Butterflies appeared almost immediately on the lower slopes, followed by four Chalkhill Blues before their season had started. They seem to be much paler than the later emergers and I have noticed this before. Gatekeepers were frequent, the most prevalent butterfly a shade ahead of the Small Skippers with the occasional Meadow Brown and Red Admiral. 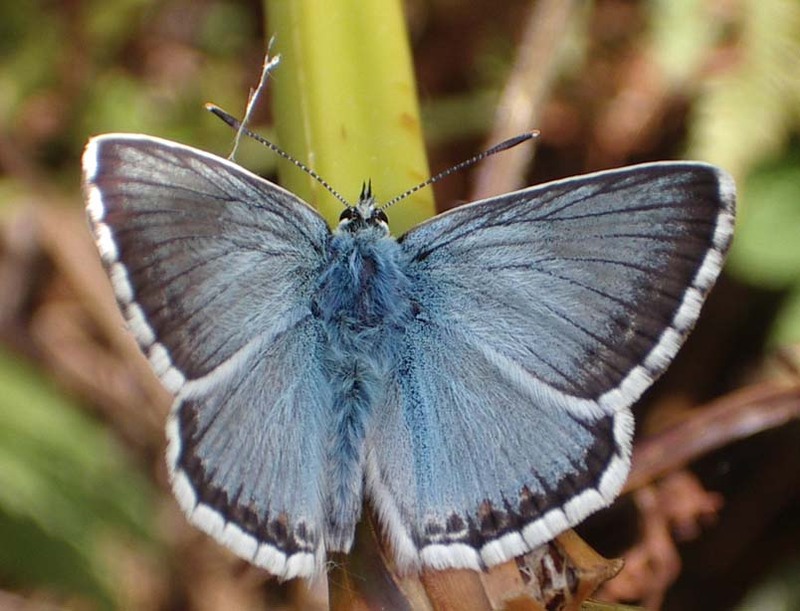 A surprise very early couple of Chalkhill Blue Butterflies were seen on the lower slopes of Mill Hill. In the sunshine I was unable to chase the skippers around to discover what they were. There could have been my first Small Skipper of the year. 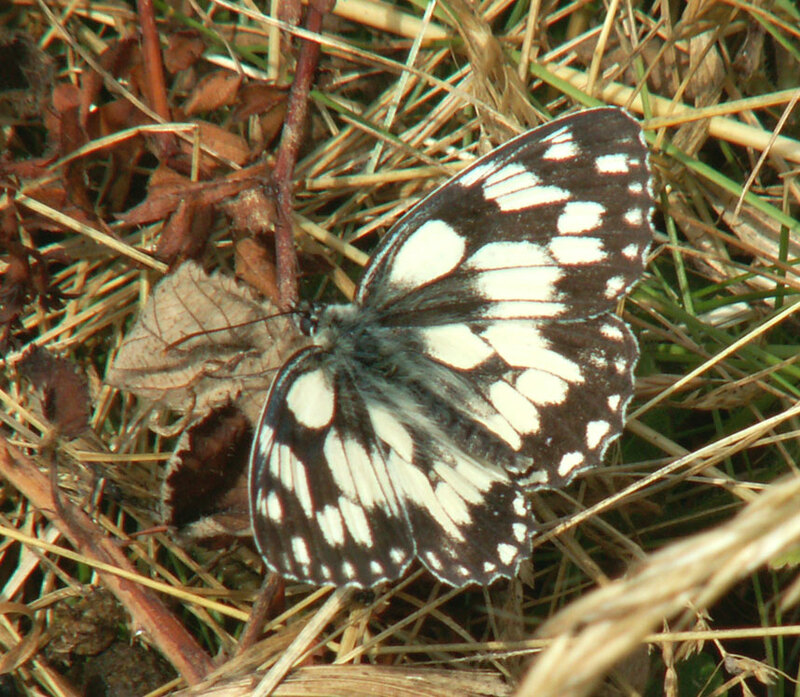 Marbled Whites led the way with 49 counted, with at least 36 recorded on the lower slopes. Meadow Browns were frequently seen. 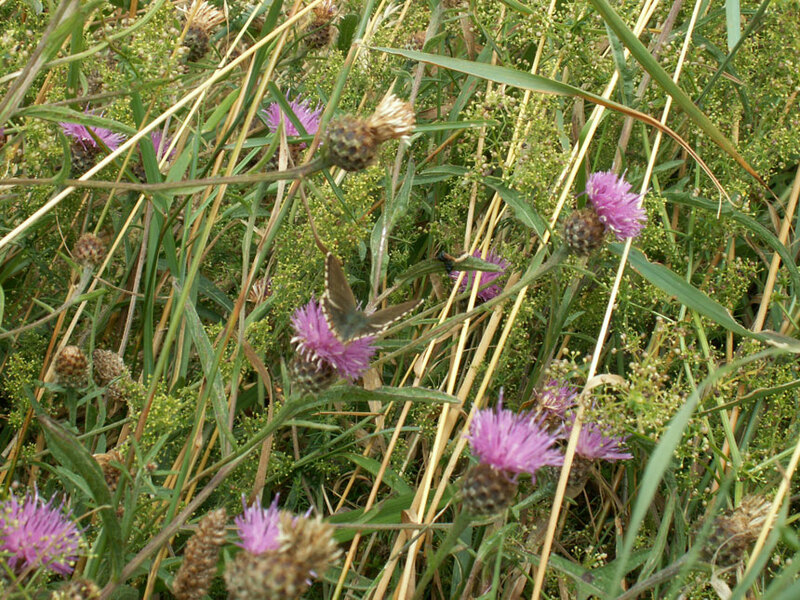 A handful of Cinnabar Moths and Silver Y Moths were recorded on the upper meadows of Mill Hill. Meadow's Cranesbill was in flower but it looked like it was being overgrown by grasses and other vegetation. A female Stag Beetle was flying around in our lounge in Mill Hill Close (south of Mill Hill) after darkness. This is number five we have seen. They were surprisingly nimble in flight but very noisy. A Stag Beetle was spotted slowly running around my garden in Mill Hill Close (south of Mill Hill) in the early evening. The first Marbled White Butterfly of the year fluttered strongly over the lower slopes of Mill Hill where the Horseshoe Vetch flowers had almost disappeared and the corkscrew-like seed pods could be discovered if searched amongst the emerging herbs and new flowers. 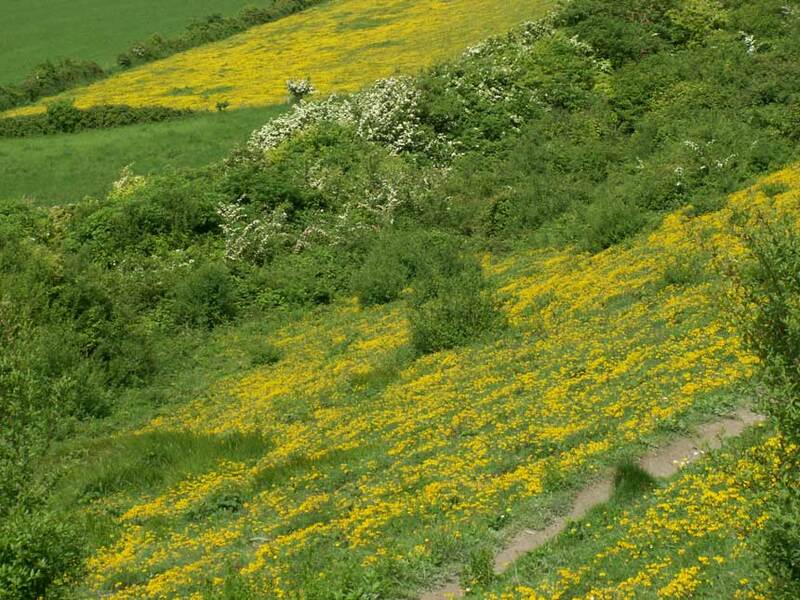 The largest yellow patches on Mill Hill were now Bird's Foot Trefoil. Meadow Vetchling was recorded. Butterflies were frequent (about 50), but not common. The most prevalent on Mill Hill were now Common Blues and Small Heath Butterflies with about 15 each. The hoverfly Rhingia campestris fed on Greater Knapweed on the middle Triangle area of Mill Hill. It was breezy at the top of the hill. Smooth Sow-thistle, Sonchus oleraceus, was recorded in the copse at the top of Mill Hill. 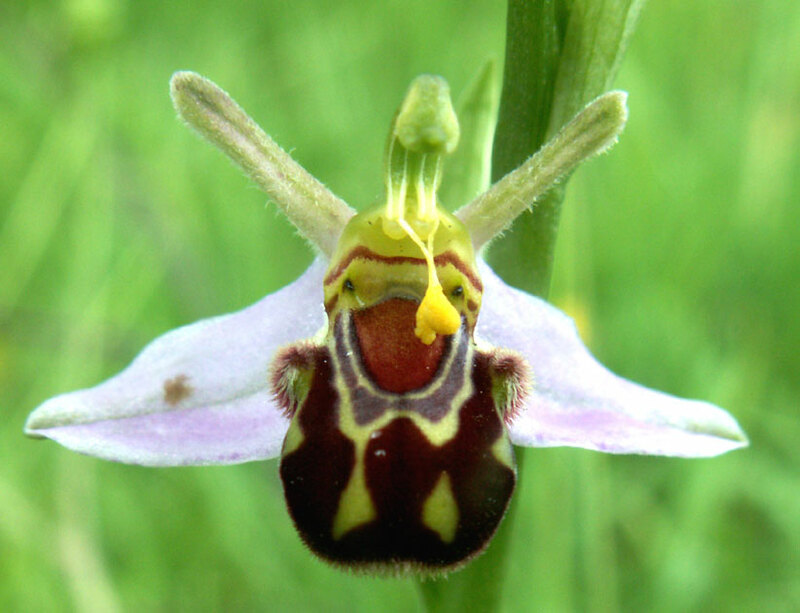 With wild flowers bursting into flower everywhere, the highlight was about a hundred Bee Orchids in Mill Hill Drive. 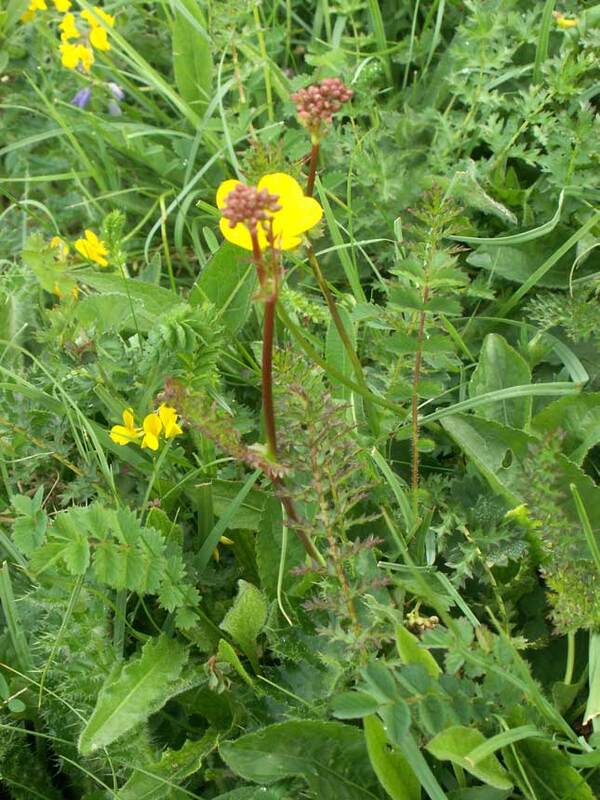 There was one Kidney Vetch flower seen on the Triangle section of Mill Hill. 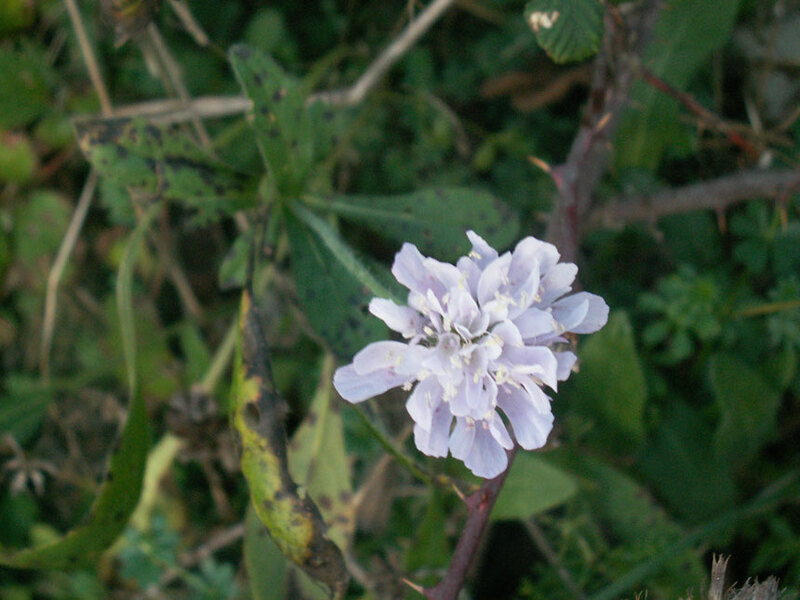 The first Greater Knapweed was seen in flower and Field Scabious. About half of the 25 Adonis Blue Butterflies on Mill Hill showed signs of raggedness and age, whereas the Common Blues appeared fresher. I spotted my first Meadow Brown Butterfly of the year on the lower slopes, where I was surprised at a settled late Grizzled Skipper and I had a better look at a Large Skipper. There were eleven different species in an hour. A Silver Y Moth, a Burnet Companion, a Treble-Bar and two pretty Mother Shiptons, Callistege mi, were all seen on Mill Hill. A Skylark rose into the air. 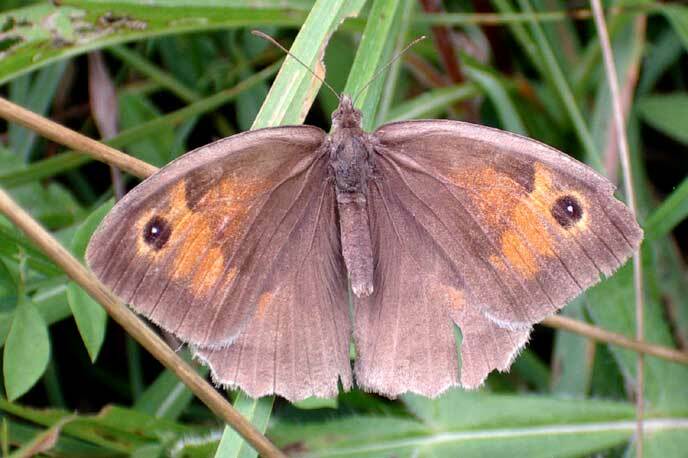 The first Meadow Brown Butterfly of the year was seen on Mill Hill. Other butterflies seen were Dingy Skipper (1), Small Heath (10), Adonis Blue (many, including several egg laying females), Common Blue (20), Brimstone (2), Small White (4), Painted Lady (1). Amongst the long grass meadow north of the top car park on Mill Hill, I had a brief sight of my first Large Skipper of the year (the only skipper of the day). I did not get a good a look as I would have liked to identify it, but Large Skippers precede the Small Skippers, so that is what it was. 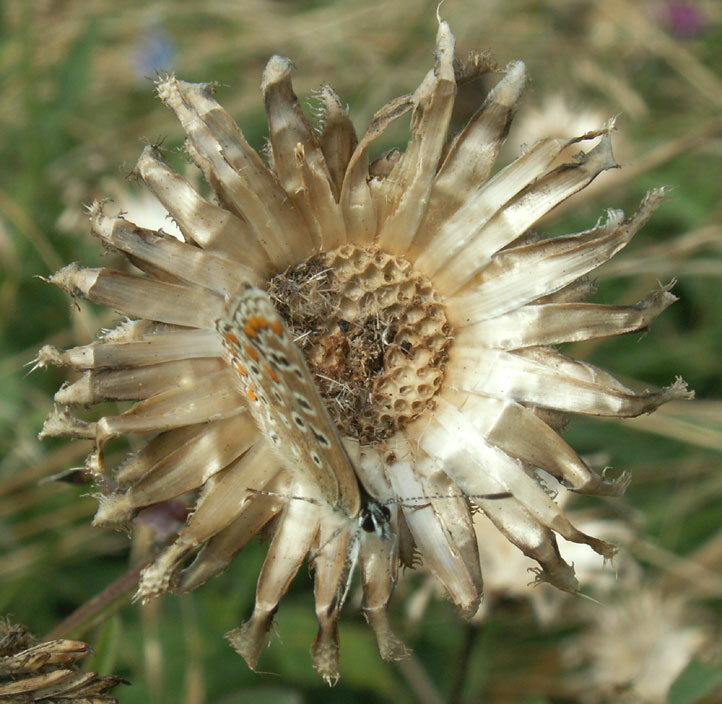 Adonis Blues (45 to 53 +) were most numerous on the lower slopes and the other species recorded were Common Blue, Large White, Speckled Wood (6), Holly Blue, Red Admiral and Small Heath (8). Near the reservoir a group of five Magpies followed by a sixth were making a tremendous chattering racket. On the lower slopes the Horseshoe Vetch had diminished considerably (it could not be seen from a distance), but the later growths on the middle and upper slopes showed patches even amongst the long grass with a handful of Adonis Blue Butterflies. Adonis Blue Butterflies were mating on the lower slopes of Mill Hill, with three mating embraces seen and at least another thirteen of these unattached bright blue butterflies flying around. Butterflies were seen in the morning included five Dingy Skippers, two Large Whites, and one each of Holly Blue, Red Admiral and Small Heath. This was less than usual for late May. 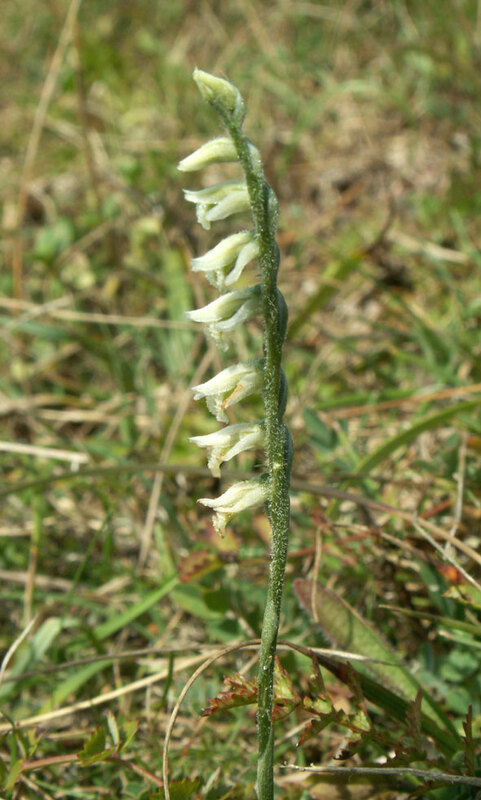 The prostrate Horseshoe Vetch was prevalent on the lower slopes, at about 70% of its luxuriance. Some flowers have not yet opened and it has appeared at the northern end which it usually does first, and has not yet appeared very much on the steeper banks, which are always a week later. In the Triangle area the Horseshoe Vetch was sparser than normal and on the upper plateau it was not prominent and was not instantly visible. 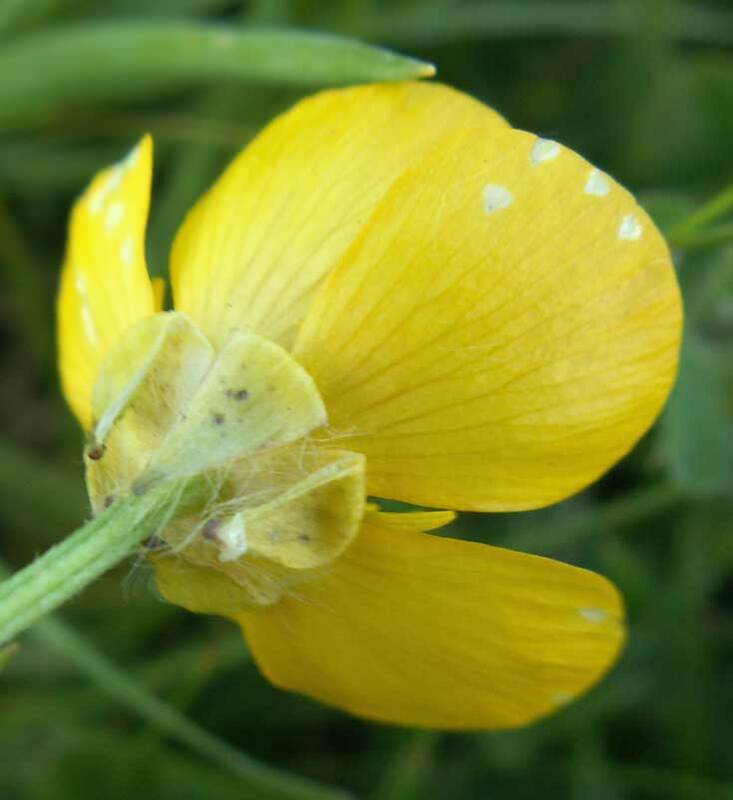 Surprisingly there were some small patches of Horseshoe Vetch lost amongst the superabundant Bulbous Buttercups and a handful of patches of Milkworts in the Old Erringham pasture to the north-west of Mill Hill Nature Reserve. Also, in the meadow north of the upper car park, an erect variety of Horseshoe Vetch was spotted amongst the long grasses with a longer stalk (over 30 cm high, but still lower than the sward) and less leaves than the plant on the lower slopes. 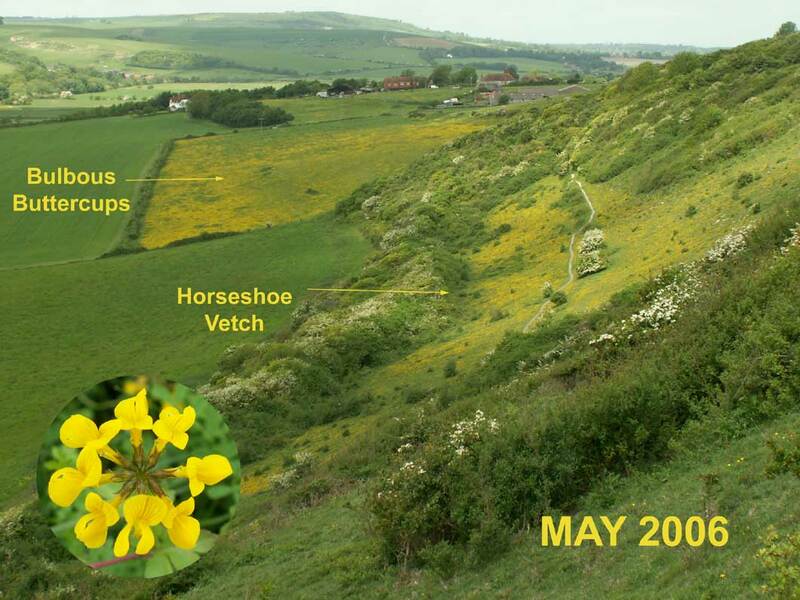 Summary: the Horseshoe Vetch is flowering over a week later than the last two years. I traversed the meadows around the upper car park and I did not note any butterflies although a Small Heath Butterfly was seen in the short sward near the reservoir. There were a few flying insects illustrated above in the dense meadows and at least one mushroom was noted in the short turf. 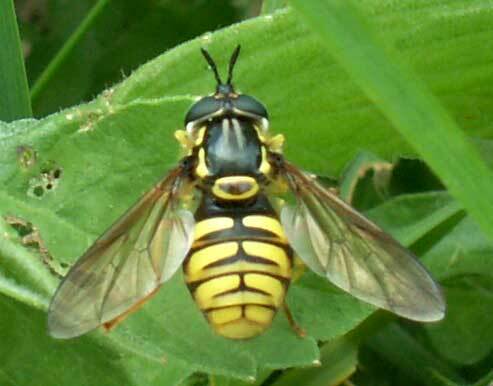 The wasp mimic is a hoverfly, a species of Chrysotoxum. 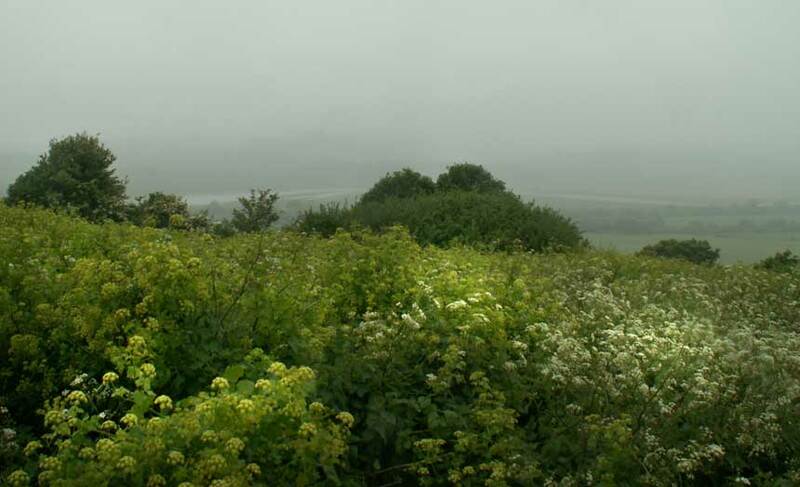 Three Swifts were seen (from southern car park of Mill Hill) flying over Frampton's Field before the cloud descended and obscured visibility and turned into steady rain that continued for the rest of the daylight. My first two Silver Y Moths of the year flew from Frampton's Field, Old Shoreham. My first two Wall Brown Butterflies and my first Brimstone Moth were seen on a brief visit to Mill Hill. Two female Pheasants took flight from the Old Erringham buttercup-strewn pastures immediately to the north-west of Mill Hill. Silverweed was flowering on Mill Hill. The leaves of the Greater Knapweed were everywhere. 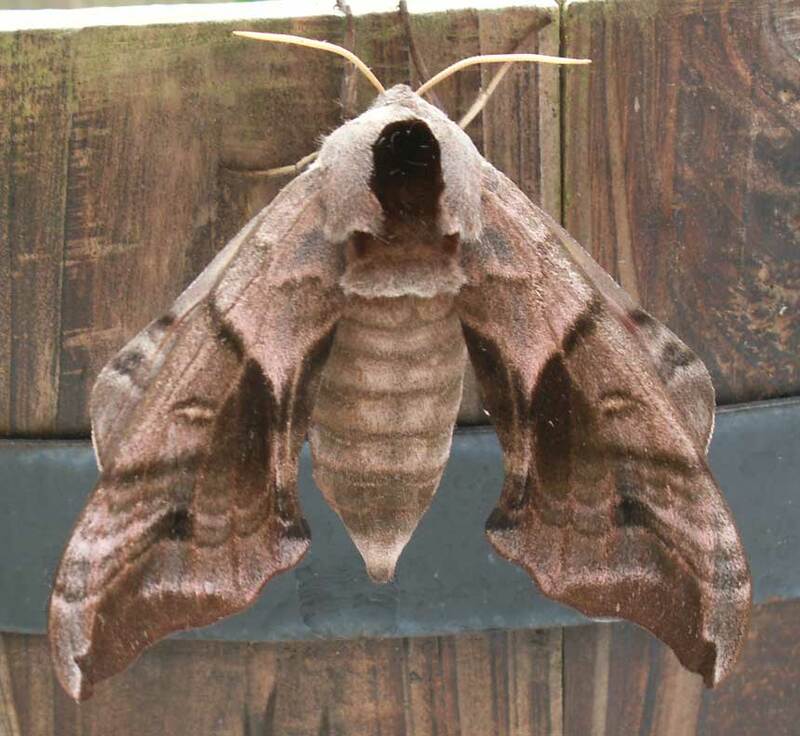 An attractive Eyed Hawk-moth, Smerinthus ocellata, was discovered on a Daffodil in my garden in Mill Hill Gardens, which was at one time part of Mill Hill. At 10:00 am the resident Kestrel hovered in the overcast sky before the start of the Butterfly Walk on the lower slopes of Mill Hill which produced just two Small Heath Butterflies and a handful of small Pyrausta nigrata moths. 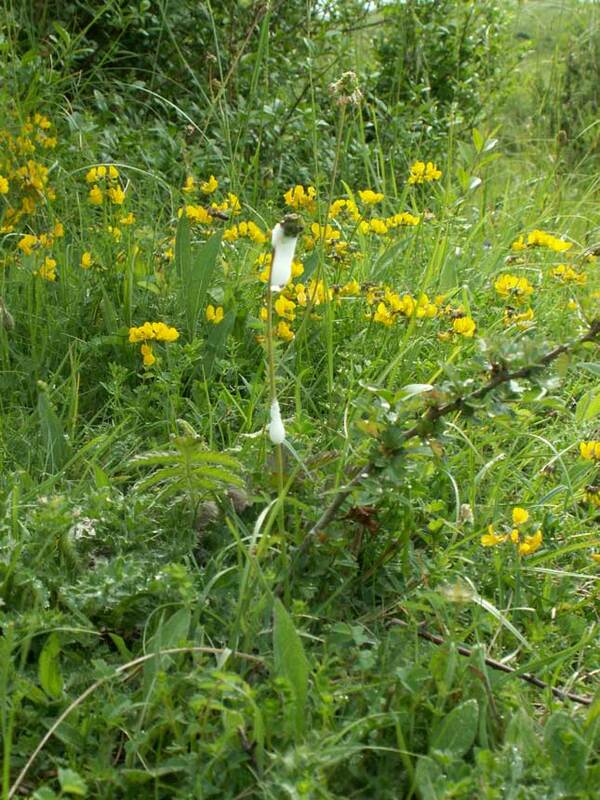 The Horseshoe Vetch was just beginning, only about 5% of its full splendour. The sun struggled to come out in the afternoon and I recorded my first male Adonis Blue Butterfly of the year on the Shoreham Bank with 13 Dingy Skippers, five Grizzled Skippers and three Small Heath Butterflies. 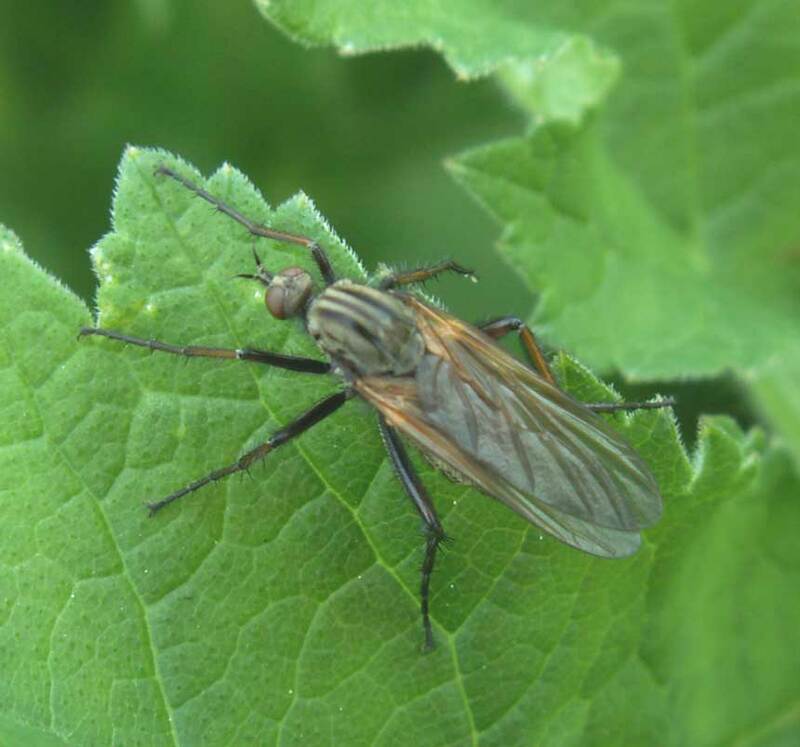 The small black flies Empis tessellata were common on the downs. A note was made of the Brown-tailed Moth caterpillars in their silk cocoons. 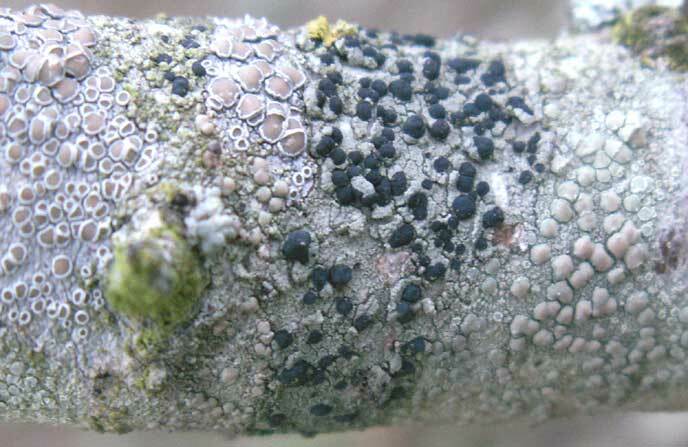 The caterpillars seem to strip the upper leaves completely (in the one example noted) but most of the Hawthorn is still in leaf and not stripped bare. 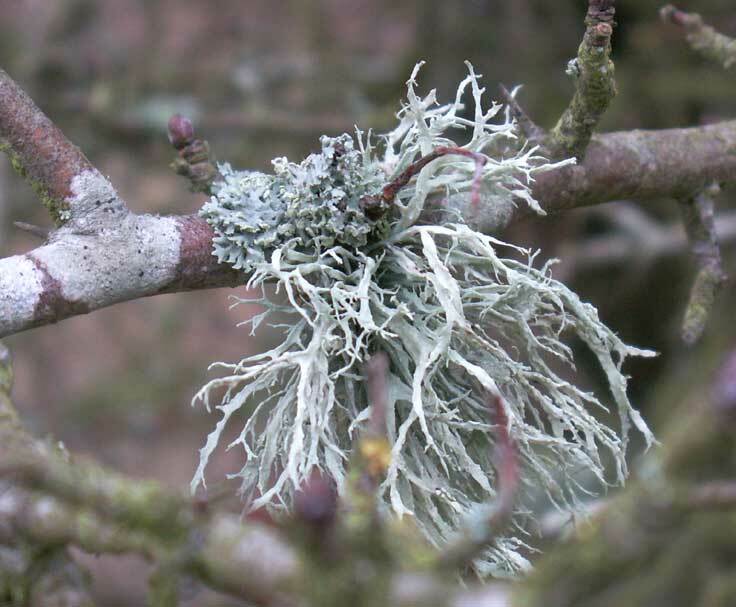 In the nearby Hawthorn without caterpillars, no damage can be seen. 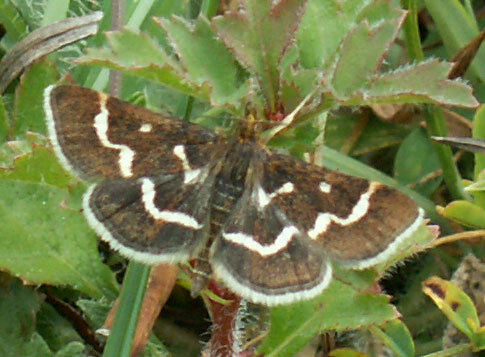 On the lower slopes the number of small moths were notable with both Pyrausta nigrata and Pancalia being common (over 100 each). Five each of Dingy Skippers and Grizzled Skippers were recorded with a Peacock Butterfly and a Large White Butterfly. 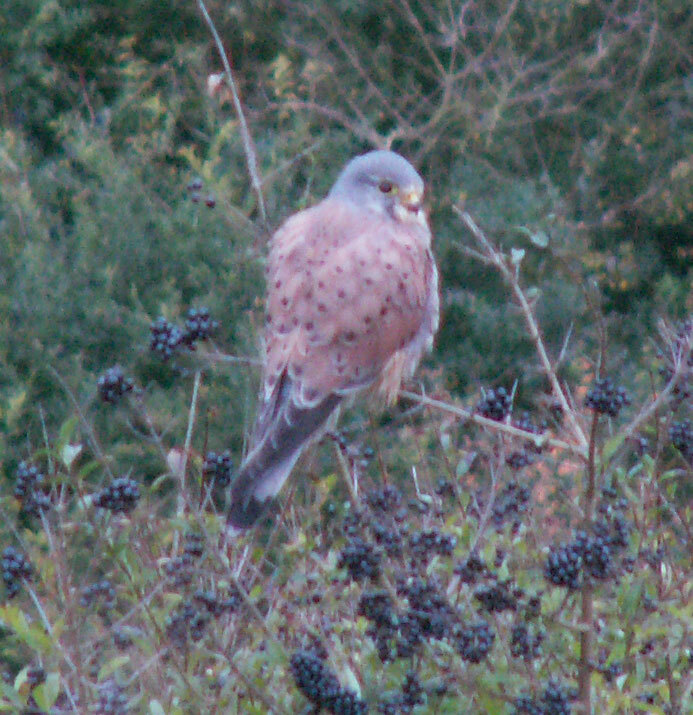 A female Pheasant whirred into flight on Erringham Hill as a Kestrel cruised overhead. South of the upper car park, a Rook probed the ground as a Skylark rose vertically and started singing until it was just a speck in the blue and white cirrus sky. At the northern end of the lower slopes I spotted my first Dingy Skipper of the year that briefly sparred with a Peacock and the size difference was most noticeable. The Dingy Skipper is the first of I have heard of anywhere this year. A few Sweet Violets still flowered under the shade of the Hawthorn, but it was mostly Dog Violets in the open. 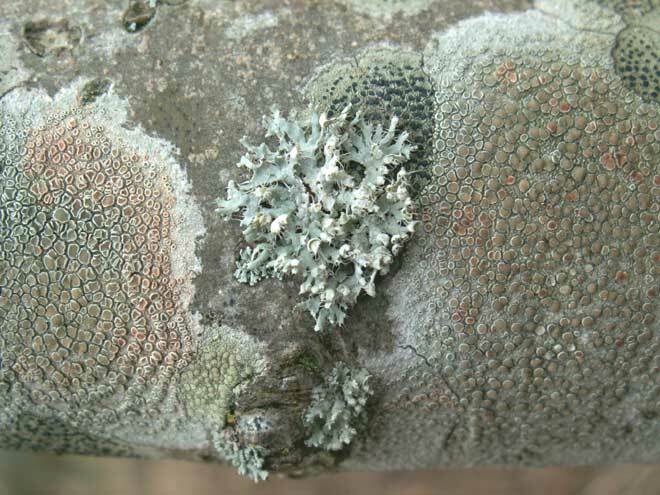 Half a dozen silken nests of the Brown-tailed Moths were noticed on Hawthorn trees on the southern part of Mill Hill. 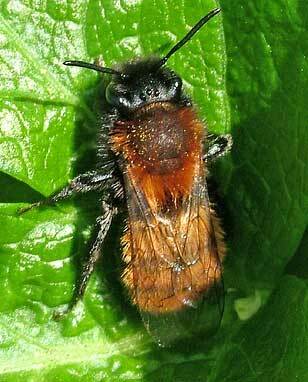 This attractive bee seen on the lower slopes of Mill Hill was the first time the Tawny Mining Bee, Andrena fulva, has been recorded on these Nature Notes pages. It is a female. 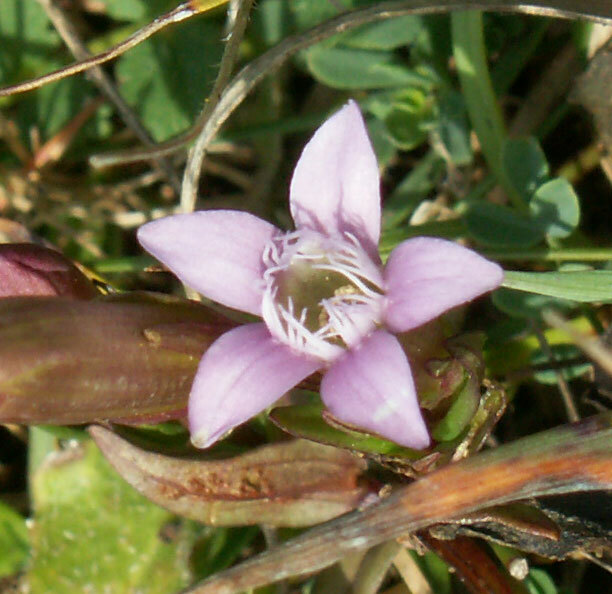 The species is common and widespread. 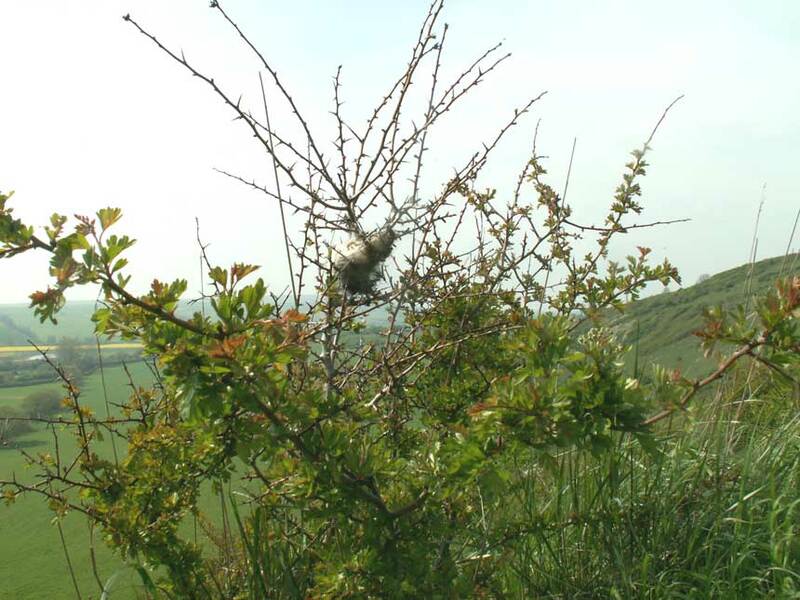 There were many silk Brown-tailed Moth nests on Brambles at Mill Hill, Shoreham and a caterpillar noted and shown the photograph. 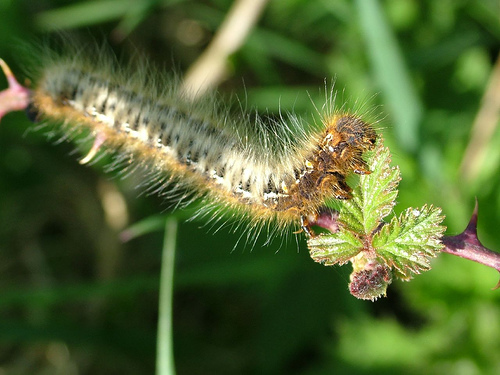 The caterpillar was not connected to the silk nests and has been identified as an Oak Eggar Moth, Lasiocampa quercus, caterpillar (which does not associate with Oak). Amongst the plants noted first in flower today were Dog Violets and Cowslips on the lower slopes of Mill Hill. But it was a remaining Sweet Violet that attracted a Peacock Butterfly. My first Swallow of the year flew low over the brow of Mill Hill and followed the country road northwards. Other Swallows had been seen by others in Sussex late in March. At last the first butterflies were seen on the lower slopes of Mill Hill: two definite Peacock Butterflies and at least one Comma Butterfly nectaring on the thousands of Sweet Violets in flower. 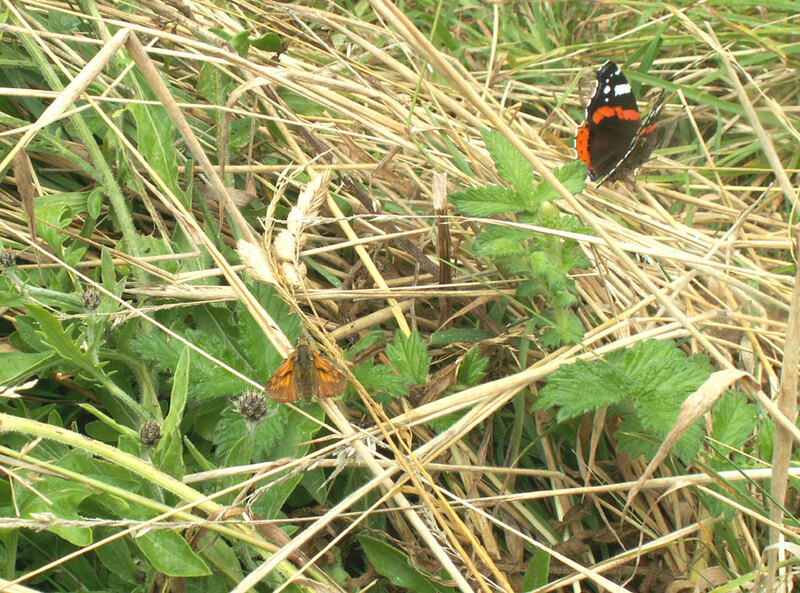 There was a probable Small Tortoiseshell Butterfly as well. A solitary Dotted Bee-fly, Bombylius discolor, a declining BAP species, was seen on a path through the scrub in the north-west and a tiny bee on a Daisy. 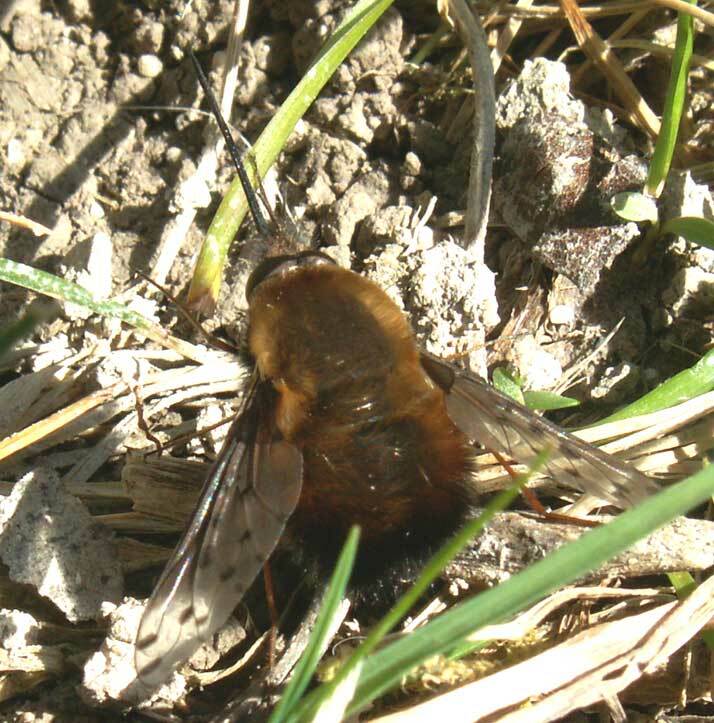 This is the first time this fly has been recorded on the downs north of Shoreham. Spring is imminent. There were Sweet Violets in flower one the slope by the most southerly seat on the southern section of the upper part of Mill Hill. These violets have large leaves. Then there were hundreds over the lower slopes of Mill Hill. These later violets have exiguous leaves. However, none of these violets were seen on the middle slopes in the Triangle area yet. The red stems of Dogwood were prominent. This woody scrub plant is the main incursor on the upper part of Mill Hill. I surprised a female Sparrowhawk perched on a branch in the spinney between the top plateau of Chanctonbury Drive (SE of the bridge over the A27 to Mill Hill) and the A27. This is on the edge of the Mill Hill Cutting. I got as close as two metres before the raptor flew off, but it was well camouflaged and it was not until I was three metres from it, did I see the bird of prey at all. It was much bigger with marked hooded eyes than the familiar Kestrel and I estimated its height at 40 cm. This is much larger than the book size of the male which is only record to 30 cm. A flock of sheep are on the private agricultural hay meadow to the west of Mill Hill feeding on the stubble and grass as is usual for short periods in the winter. The cattle have been removed from the "lambing field" or intermittent pasture to the south-east of Old Erringham Farm and will not now venture on to Mill Hill. This is probably because the grass on the land has now been grazed to its optimum and is best left for the spring growth. 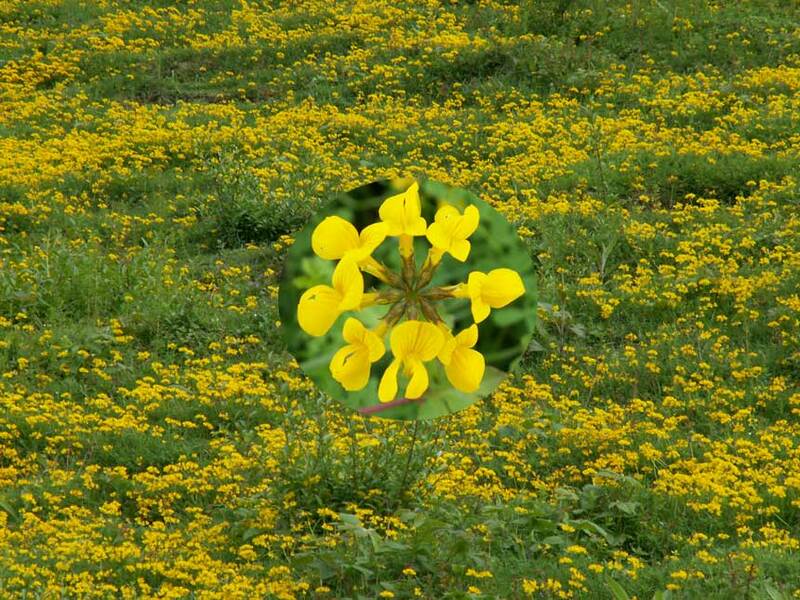 This pasture is of no butterfly value although the fringes may contain the occasional wild flower. 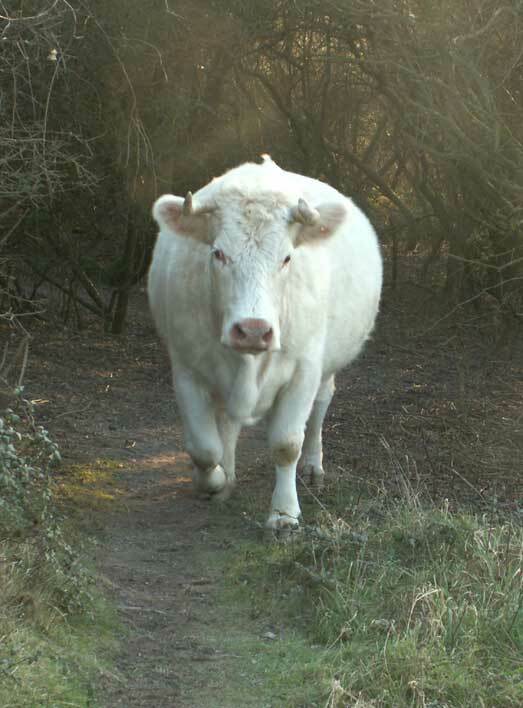 There are cattle all over Mill Hill from Old Erringham Farm enriching the low nutrient hillsides with their dung and threatening the flora (Horseshoe Vetch) and the internationally important population of Chalkhill Blue Butterflies. It looks like the fence was broken down deliberately, probably at the instigation of the South Downs Conservation Board on public land given to the people of Shoreham. There is also the danger or erosion, breaking up the steps under the hooves of the cattle and reduction of the amenity value of the downs. They were timid cattle and they were shooed of the vulnerable lower slopes by the public. Most of the dung was on the steps near the stile in the north-west corner of Mill Hill Nature Reserve. There were a couple of House Sparrows next to a small eight caravan illegal encampment in the upper car park of Mill Hill which are unusual for this area. On the pastures to the east of Mill Hill a handful each of Rooks and Magpies were foraging and on Mill Hill there were a few Crows. It is muddy under foot when human feet had trampled, with squelchy bits and puddles. 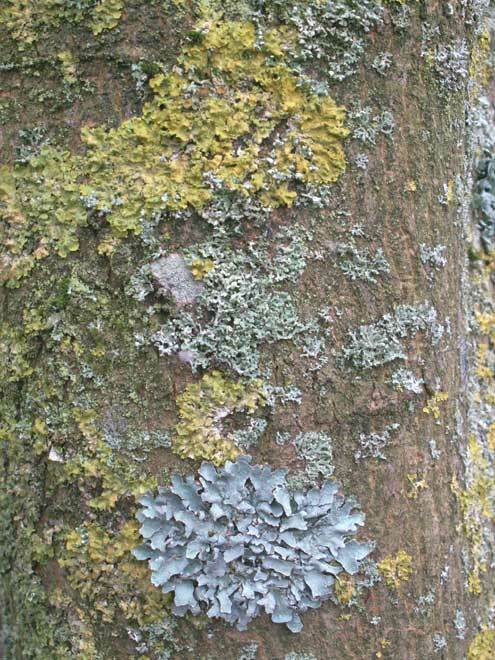 One tree on the upper slopes sported at least four of the common local lichens. My first visit of the year in the afternoon to the southern area and lower slopes of Mill Hill failed to find anything remotely newsworthy. The lower slopes looked more grassy than normal after the rain and there was still discarded chopped down Privet laying about. 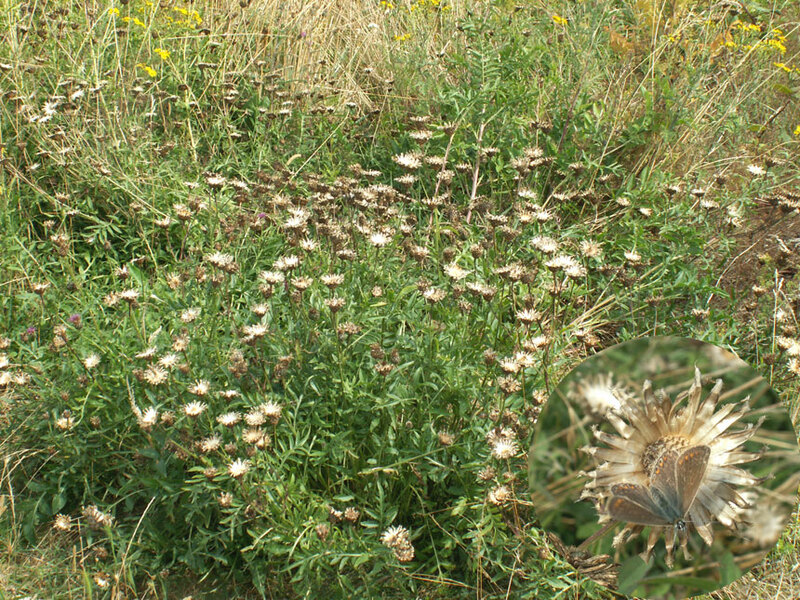 The remains of Carline Thistle were showing and the scrub was adorned by the straggly remains of Clematis. There was a discarded mushroom, which was probably Honey Fungus. The following may occur but it has not been positively identified (because it is elusive and hard to spot): Green Hairstreak.